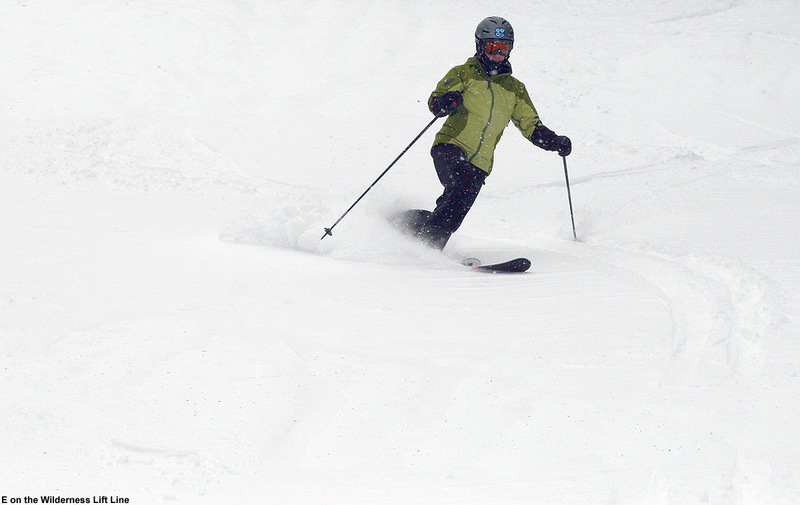 Up to eight inches out there today at Bolton Valley made for some great turns. After Winter Storm Goliath last week, we moved into a pattern of snow showers with minor accumulations here and there ahead of a cold front that passed through the area yesterday. 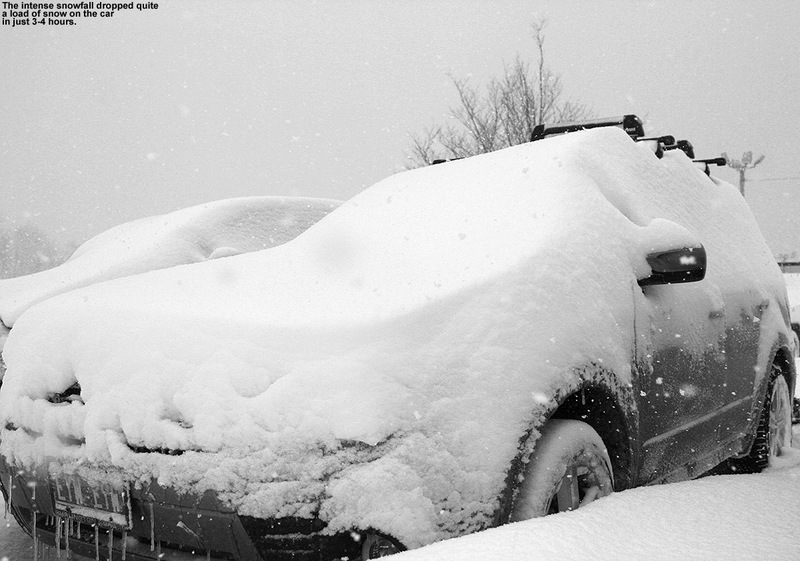 The approach of the cold front intensified the snowfall, resulting in snow totals of up to a foot in the Northern Greens. Unlike the dense snow from Winter Storm Goliath, these latest rounds of snow have been light and dry, with densities of 3-6% H2O based on my analyses. 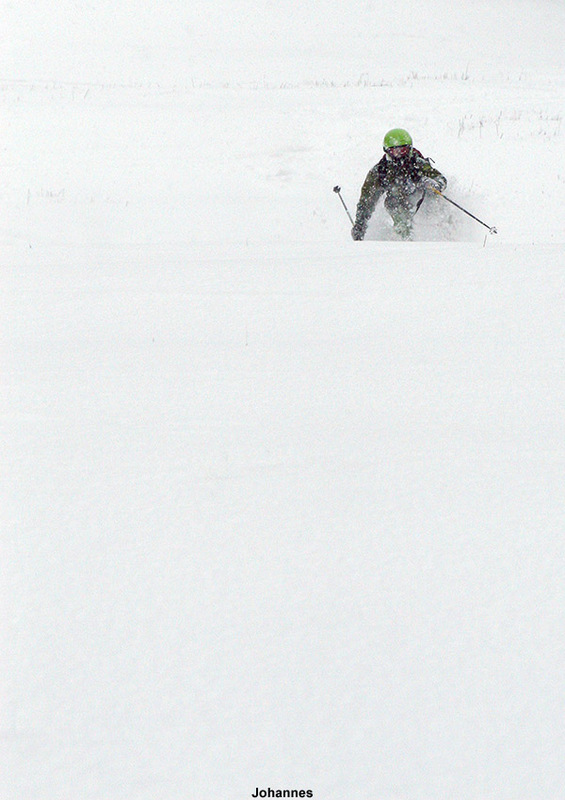 With this fluff on top of the dense snow, it was actually a setup for some great powder skiing. The temperature drop with the arctic cold front was notable, with highs expected to be only in the single digits F today, but I still wanted to get out for some turns and exercise, so I decided to go for a ski tour up at Bolton Valley this morning. Despite temperatures running in the low single digits as expected, I was happy to find that there wasn’t much wind as I ascended the Bolton Valley Access Road. 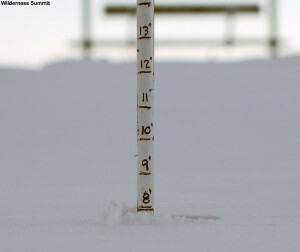 I swung into the Timberline parking lot at 1,500’ on my way up the road, and measured 4-5” of powder over the old base. Although likely serviceable for some turns on appropriate terrain, I know that the base snow is a bit thinner down at that elevation, so I continued on up to the Village at 2,100’ to start my tour. It was right around 0 F up at the Village, and there was the occasional bit of breeze blowing things around, but it was nothing like that wind from last Tuesday during Winter Storm Goliath. I ascended via the designated Wilderness route, and for the first time this season it felt like it was worth a trip all the way to the Wilderness Summit. Indeed that was the case, as the new snow kept getting deeper and deeper, eventually reaching a point where even black diamond terrain was quite skiable. The person before me who had set the skin track up to the summit had descended via Bolton Outlaw, and the turns looked quite nice. I can’t say that all the snow up on the mountain was necessarily from the past 24 hours, but it’s very easy to distinguish the new powder from the dense base snow that we picked up from Winter Storm Goliath. 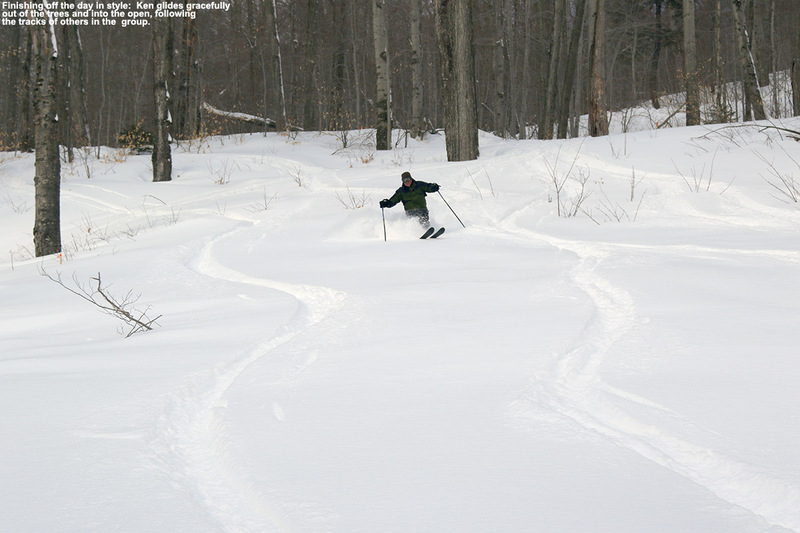 Wanting to go for something with a bit more pitch lower down, I passed by Bolton Outlaw and headed to Upper Fanny Hill so that I could also ski its lower portion. Upper Fanny Hill has a healthy black diamond pitch, and in terms of coverage it’s easily good to go now with the dense base covering up everything but the obvious major obstacles. I did find a good representative spot from which I could assess total snowpack depth at around 2,700’, and found it to be 14-15”. There’s a lot of single-black terrain at appropriate elevations that I suspect is good to go for at least the touring crowd, although I’d say one more good shot of liquid equivalent (an inch or so) would be needed to get things going for lift-serviced levels of traffic. I’m sure the mountain could open some natural terrain consisting of mellow pitches at this point if they chose to. 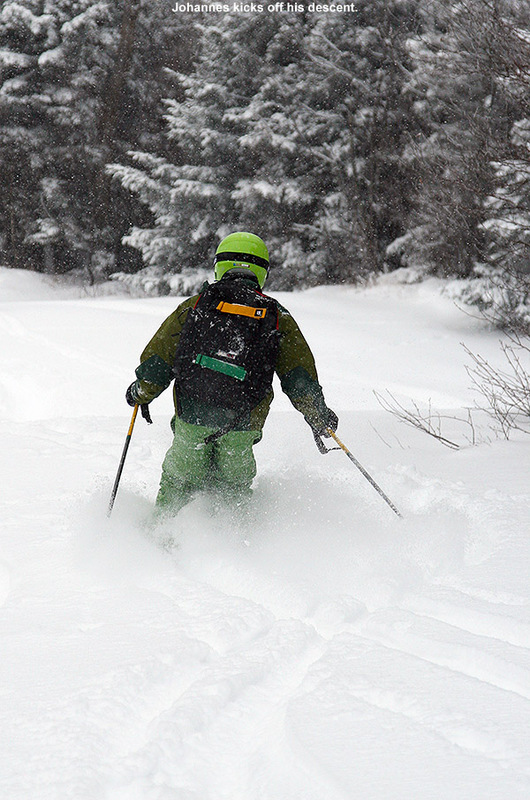 In any event, the powder turns were excellent this morning, with my only complaint being that it was “slow snow” due to the very cold temperatures. 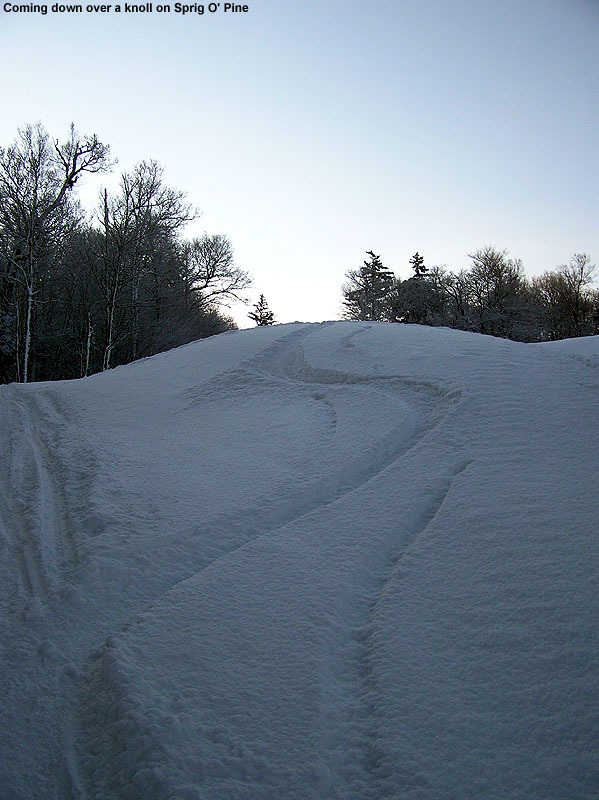 Even with 115 mm fat skis keeping me afloat, I had to go steeper than the pitch of typical green terrain for a good ride – in that respect, Fanny Hill was a better choice than Lower Turnpike as I suspected. We’ve got a couple of potential storms coming up this weekend that may deliver something more like Winter Storm Goliath in terms of liquid equivalent. 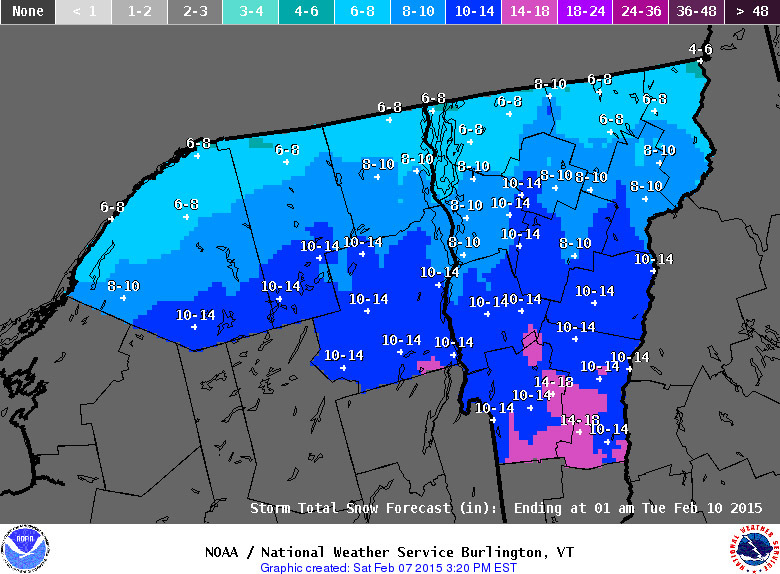 They probably won’t deliver the type of Champlain Powder™ we had with this event, but if they play out well they could set up the base to open a good amount of natural snow terrain. 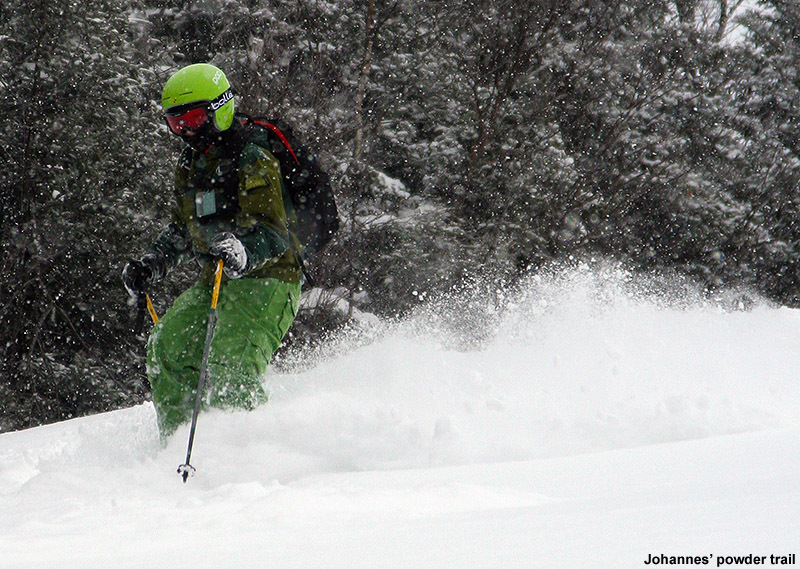 After a moderate shot of snow from Winter Storm Pandora, it was quite a powder fest out there today at Stowe. 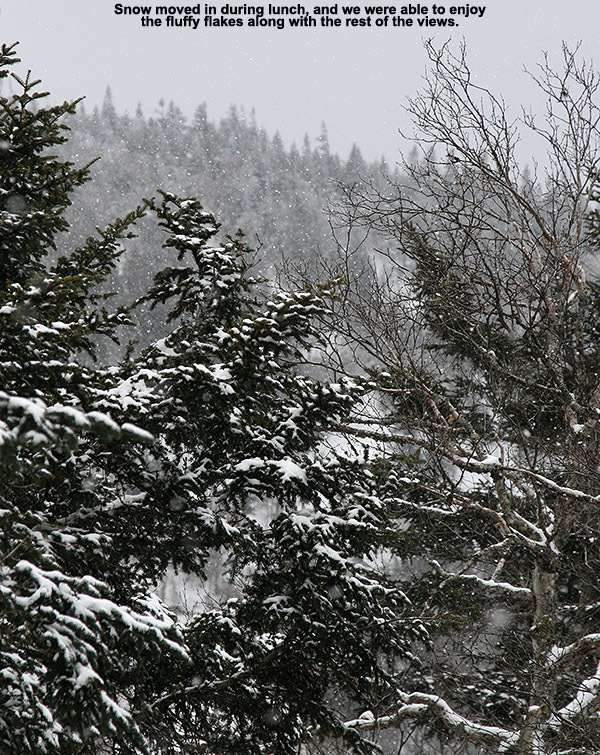 Beginning yesterday afternoon when we were skiing up at Bolton Valley and well into the night, Winter Storm Pandora unloaded inch per hour snows on the Green Mountains. 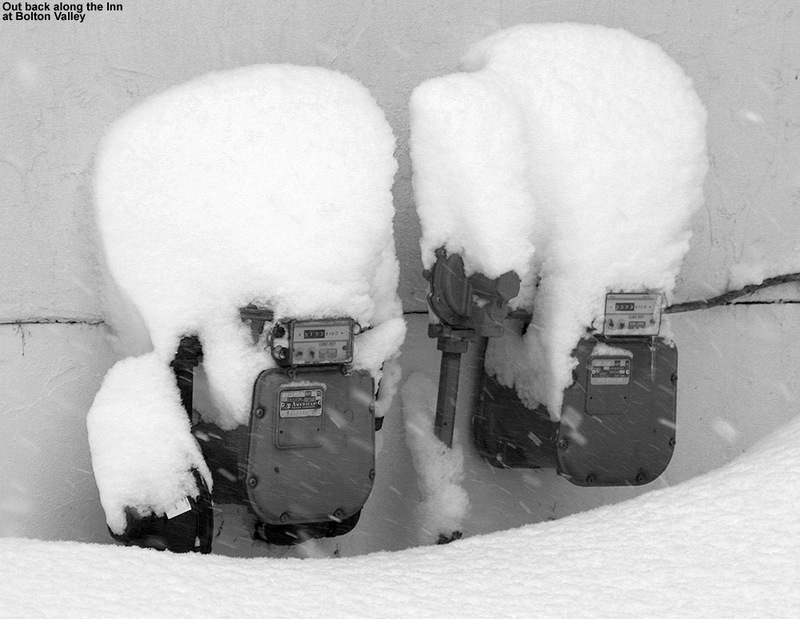 As of this morning we’d picked up over 8 inches at the house, and accumulations at the resorts in the Northern Greens had topped out around a foot. 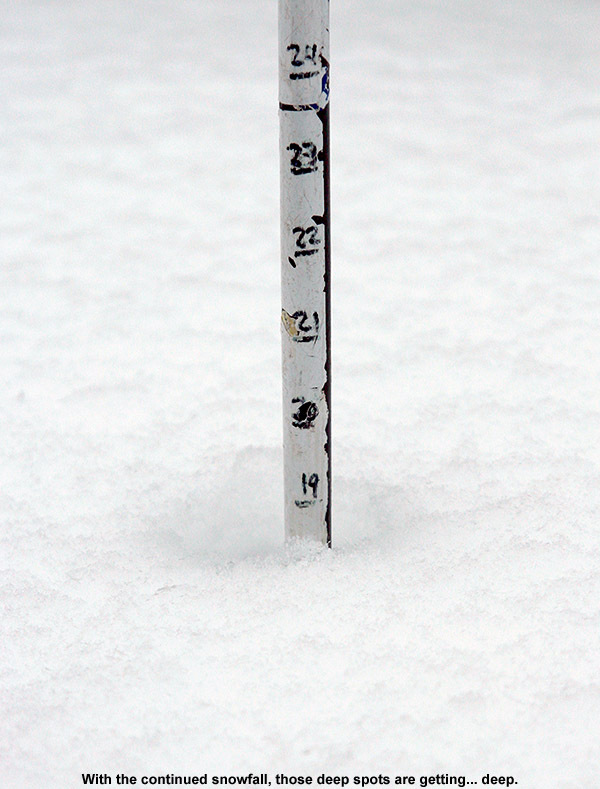 The snow was incredibly dry; the stack at our house came in at 3.5% H2O. 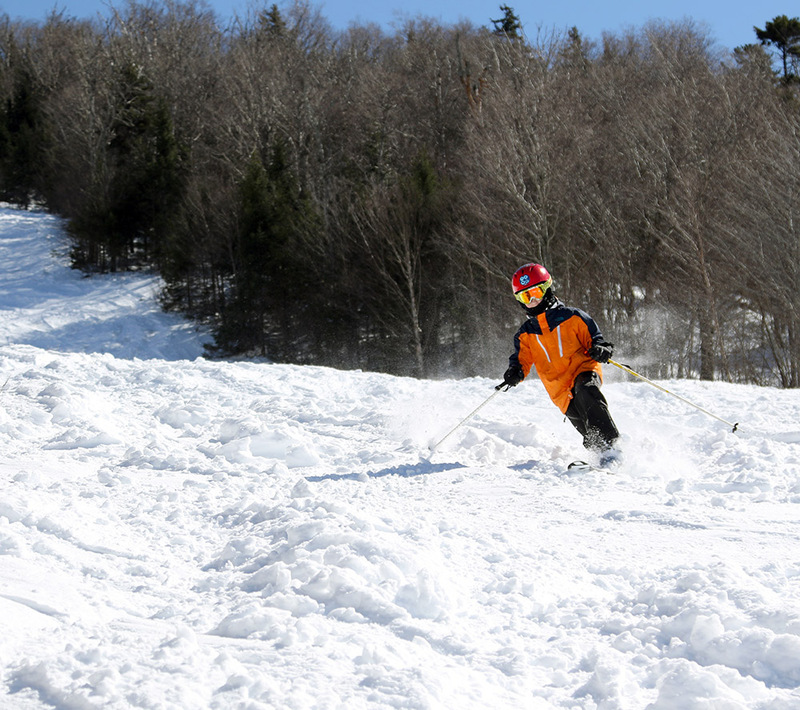 It looked like a good day to kick things off early at Stowe ahead of our afternoon BJAMS ski program, so we headed over to the resort in the morning. 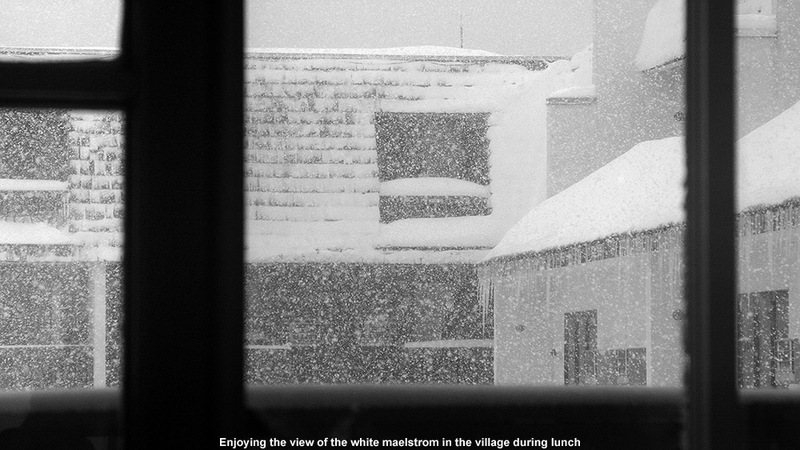 When we arrived there was another round of snow falling, setting the mood for what would hopefully be a great day. E decided to hold off with skiing or riding until her coaching obligations in the afternoon to make sure that she didn’t work her injured toe too much today, so she relaxed in the Spruce Camp Base Lodge and did some ski program coordinating while the boys and I headed over to Mt. 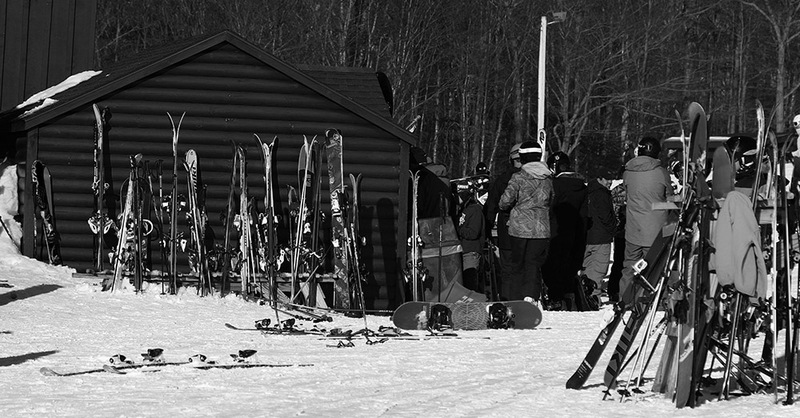 Mansfield to start the day on the slopes. 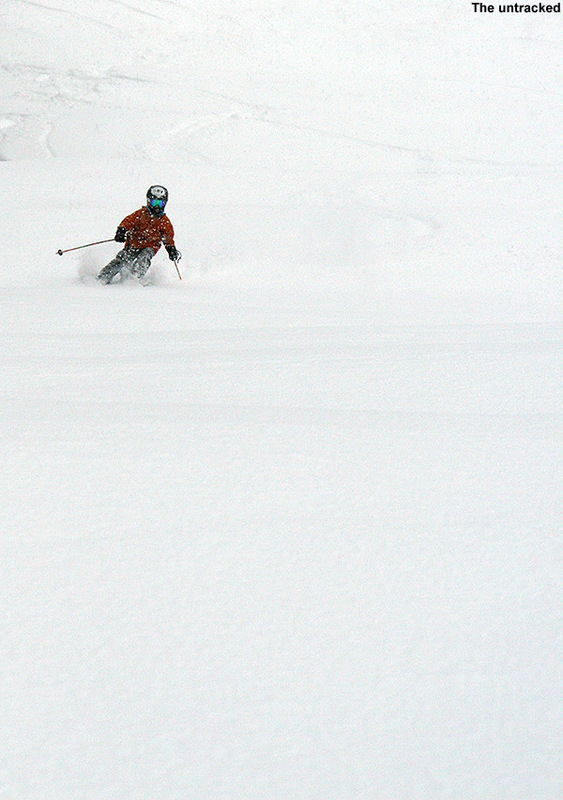 This was definitely not a sleeper powder day. There was a queue almost out the Gondola building by 9:00 A.M., and the trails were already tracked out. Even all of the easy access trees seemed to have been hit, and not with just a couple of tracks We headed into the trees for powder, visiting Ravine, the Kitchen Wall, the Hazelton Zone, and then some new terrain off the western end of Spruce Peak. 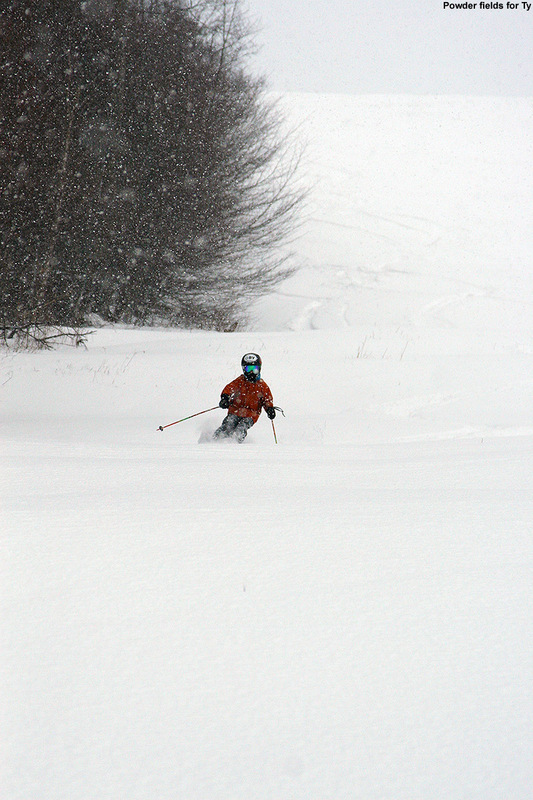 The powder was fantastic, and temperatures in the 20s F felt so nice for a change. With powder so light and dry, it really didn’t keep you consistently off the subsurface in those areas that had been groomed or previously packed by skiers, but if you got into untraveled terrain, the fresh snow represented another beautiful Champagne Powder® icing on the soft cake that is the current snowpack. I’m starting to give up on checking the surface snow depths for the time being because my 40+” pole simply disappears when I push it into the powder. In any event, even where the subsurface was packed, there’s not much that compares to gliding through that kind of delicate cold snow. After lunch with E in the Great Room Grill, we met up with our group and got back out for some more. We did an Angel Food run, which yielded some large areas of fresh snow farther left, and then there were plenty of options for fresh tracks all around the return traverse as well. We visited the Kitchen Wall again, headed far to the south for a change of pace, and then dropped off Nosedive for a different approach to Hazelton. We got into some of those big, north-facing gullies that I’ve seen in the past and wanted to visit, so that was a nice accomplishment. With nine in the group there were certainly a few episodes of people getting stuck in the deep powder. In one instance, Ken lost a ski on an encounter with some obstacle, and it looked like we could be in for one of those incredibly long “ski search and rescue missions”. He was in a spot right where the terrain was starting to roll over and get steeper, and the powder out there is so bottomless, it was really going to be tough to track that ski down if it slid away under the surface. I was the only one within reasonable distance to be able to help, so within a couple of minutes of his initial searching I’d made it up to him and I prepared myself for a thorough and systematic process of probing the snow. Everyone else in the group was within 50 yards, but downhill, and with slopes that steep combined with powder that deep, they might as well have been on the moon. I was really wondering how we were going to manage everyone’s time. We were lucky though, within about a minute, I happened to look down the slope and saw his ski sticking up out of the snow. He quickly got it and we breathed a sign of relief – that’s the sort of stuff that can really slow down the group, and of course the odds of that stuff happening increase with each addition to the group. I’ve got to say though, the trip was really pretty efficient for as big as our group was. It’s definitely helpful that Ty and I have been in that area a few times now and have a feel for the lay of the land. One big advancement in my knowledge of the area today was in exploring some of those ridges and plateaus between the gullies. 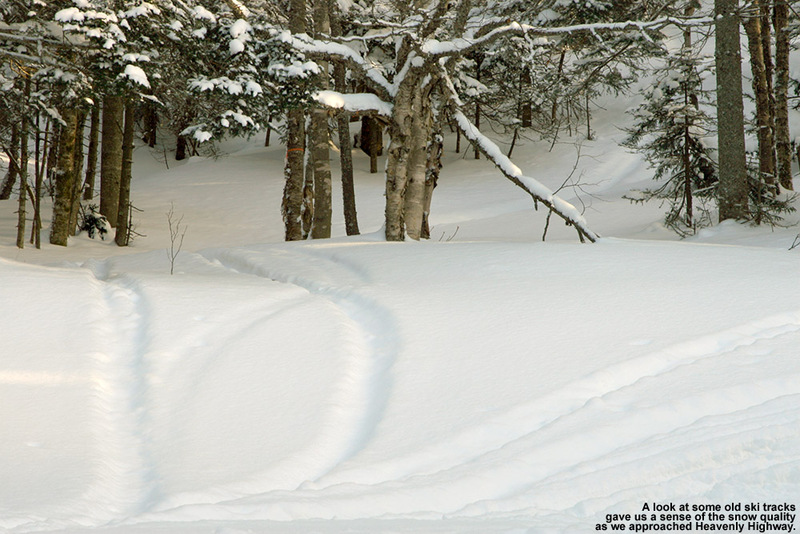 The gullies are typically the first areas to get tracks in them, since people are naturally drawn down into them by gravity. 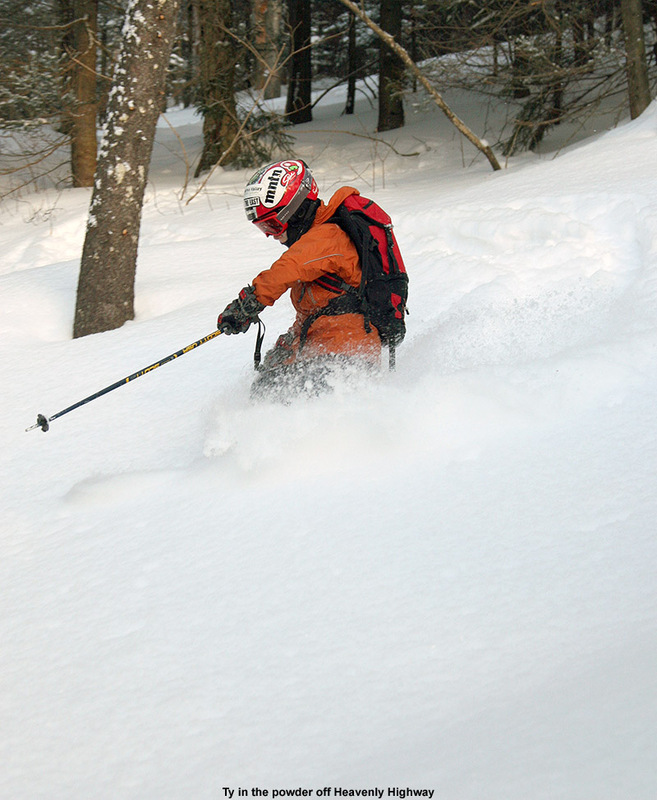 There is some excellent skiing on the ridges in between though, and they are typically untracked and yield some seriously steep and deep powder as the pitches drop back down into the gullies. I nailed some really sweet turns after helping Ken find his ski, so that was quite the reward. Deep champagne powder and sunshine… definitely ingredients for a great ski day. We returned to Spruce around 3:00 P.M. to finish off the day, and mixed up a number of runs off Sunny Spruce, including the terrain that Ty and Dylan and I had explored earlier that morning. All the students really did well in the trees today, and they’re getting more and more comfortable as time goes on. If the snow continues to stay this good we’ll have some excellent options with the group in the coming weeks. Although Stowe’s plentiful amount of visitors meant that on piste areas were tracked out pretty quickly, venturing off piste and exploring areas old and new provided great powder all day long. 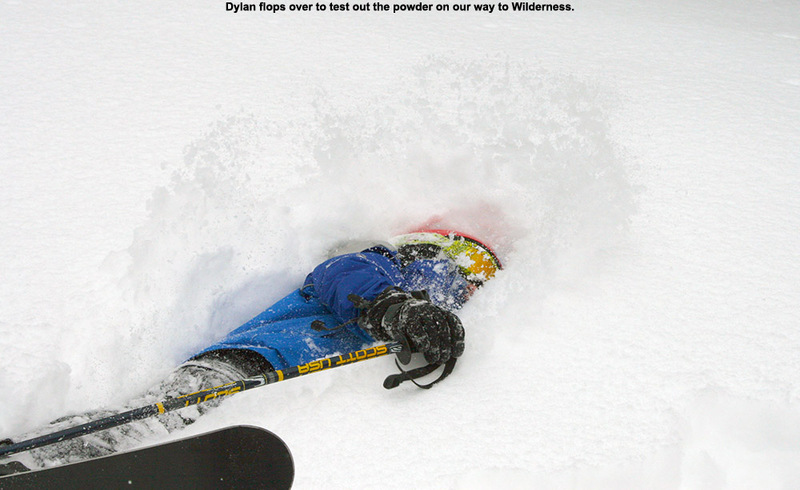 Today when it was suggested that Dylan charge the powder… he did. 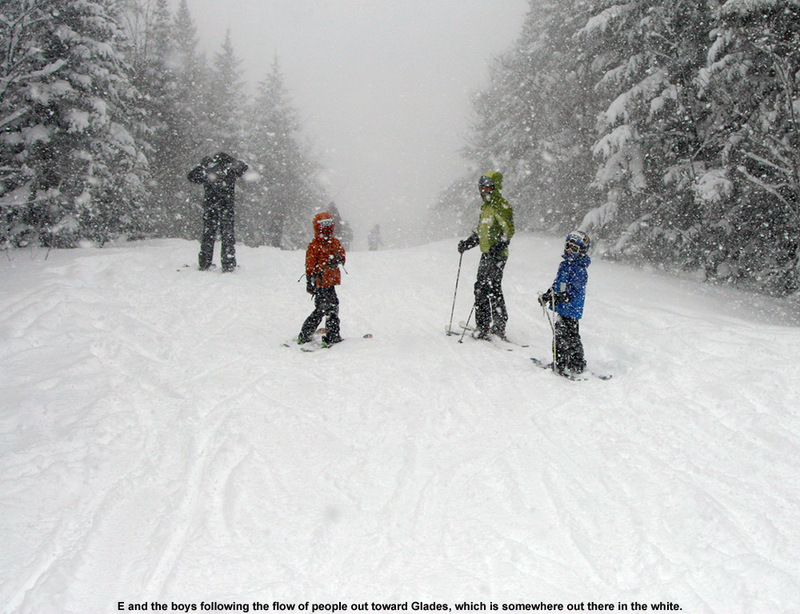 On Wednesday I sent out a ski alert message to the regional members of the 311 crew concerning the upcoming weekend. 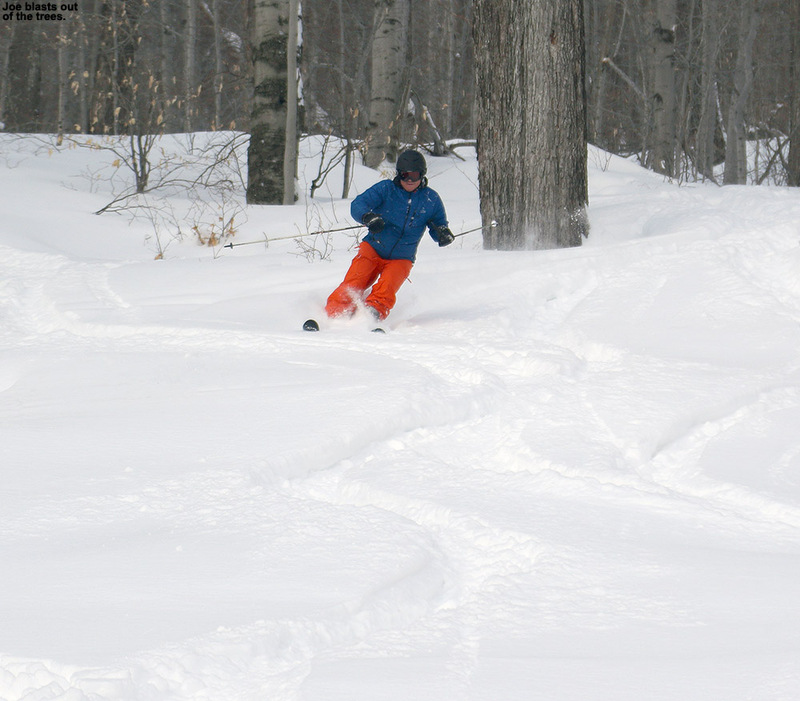 Although there wasn’t a massive winter storm cycle brewing, it didn’t matter; conditions on the slopes have been so consistently excellent that when combined with temperatures rising to near 20 F in the valleys, it was prime time for getting some turns. I learned that E’s sister Tina was planning to come up with her family for some skiing this weekend as well, so their timing was excellent. Chris pretty quickly answered my alert and said that he’d be able to catch up with us for skiing on Saturday, so it looked like we’d have a fun group for the slopes. The Friday night forecast called for about an inch of snow due to a weak disturbance approaching from the Great Lakes, so I expected that we’d at least have a little something to top off the slopes in the morning. I began to get a little suspicious though when we’d picked up nearly an inch down in the valley as of 11:00 P.M., and by midnight the snow was coming down at an inch per hour. I knew that up at the mountain they’d be getting at least as much as we got down here, but would they be getting one of those Green Mountain surprises where you find a foot of snow on the ground the next morning? 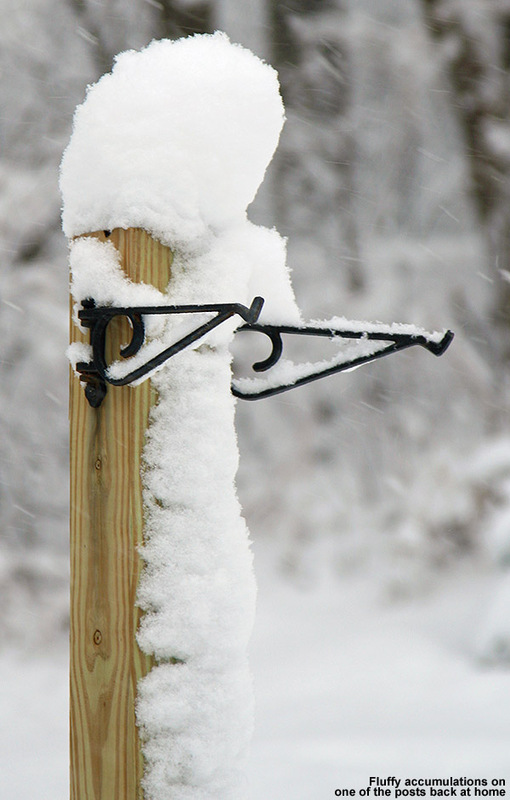 It seems like we just went through this routine a couple of days ago, but when I checked the morning snow report, indeed the Northern and Central Greens had worked some of that magic to produce accumulations of up to a foot. 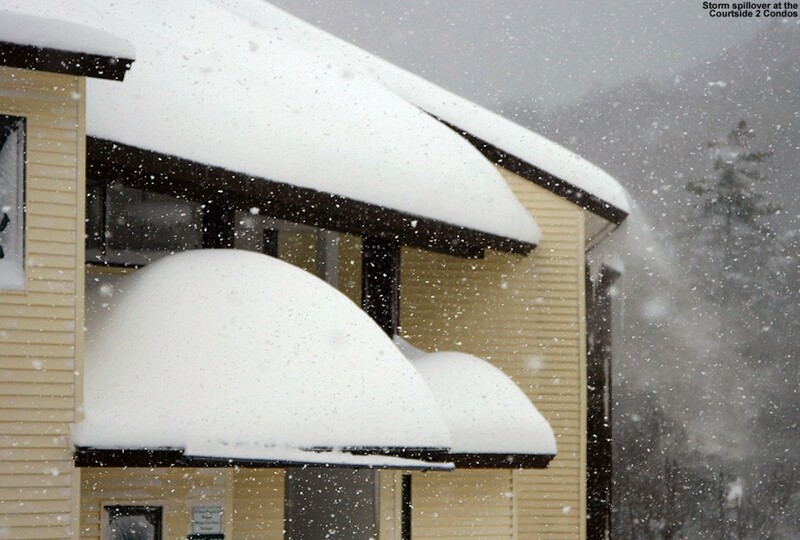 Up at Bolton Valley they were reporting 9″ new, and that would certainly change the dynamics of the day a bit and give it a more “powder day” atmosphere instead of just a good day out on the slopes. My CoCoRaHS analyses here at the house were consistently showing snow densities in the 2% H2O range, so we were going to be able to get Tina’s family a taste of some real Champlain Powder™. We made it up to Timberline just as lift service was getting going, and there were only a few cars in the lot. The resort was actually trying a new parking method in which people were directed to enter at the far entrance and come back toward the main parking areas, but it was a bit confusing and we ended up going in the usual route by accident. It worked out fine though, and the attendant said that he suspected the switch would be tough when we’re so used to the usual entrance. Temperatures were decent, somewhere in the teens F, and wind was nonexistent, so prospects for a reasonably comfortable ski day were looking good. We could see that there had been some grooming on the lower slopes of Timberline during the overnight snow, so we visited Tattle Tale and Spell Binder to start off. 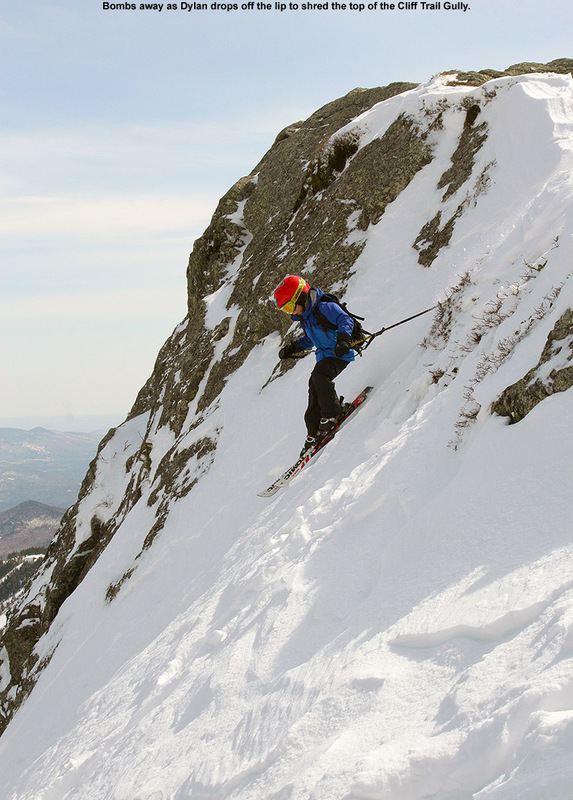 Their headwalls don’t typically get groomed, so they offered a good combination of pitch and powder. 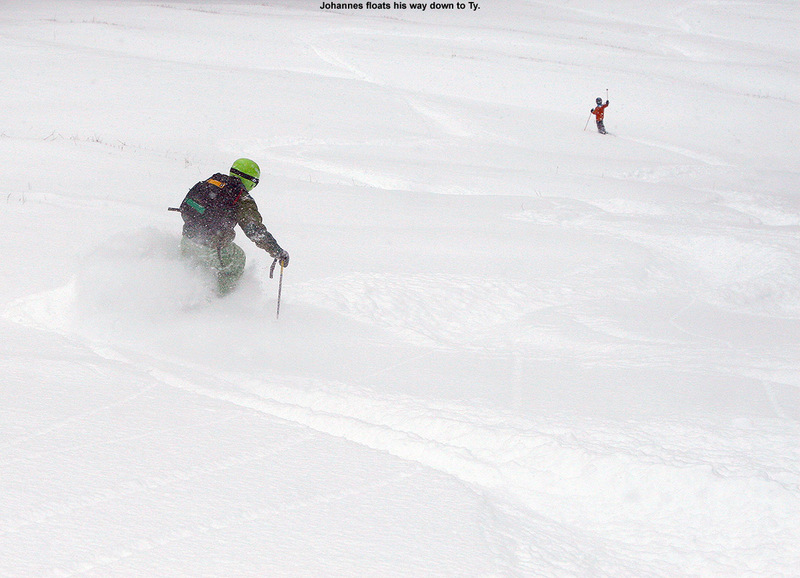 Both headwalls had some scoured snow in the middle, right near the top, but all around they offered up some great snow. 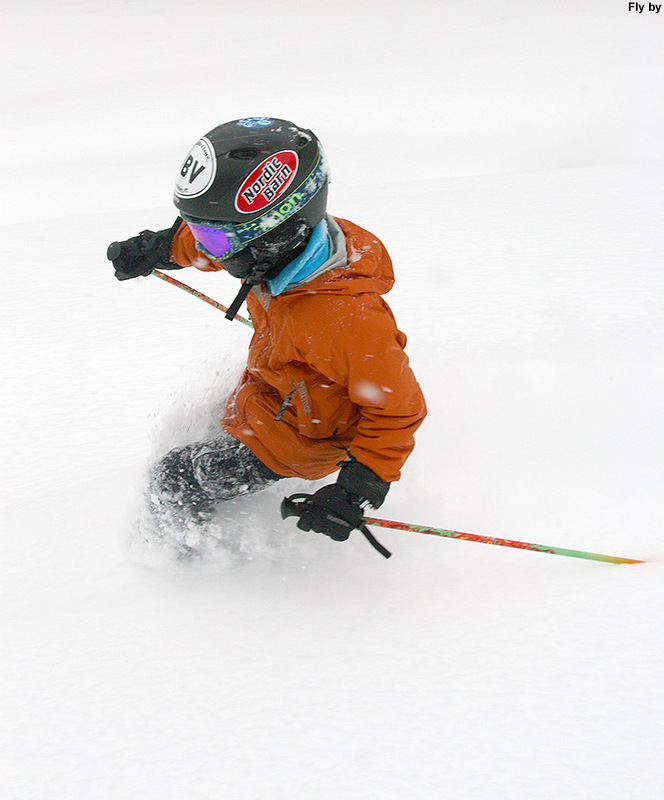 It wasn’t completely bottomless since the powder was just so dry, but you were still doing a lot of floating. Riley and Nikki were sending up some huge sprays of snow with their snowboards. 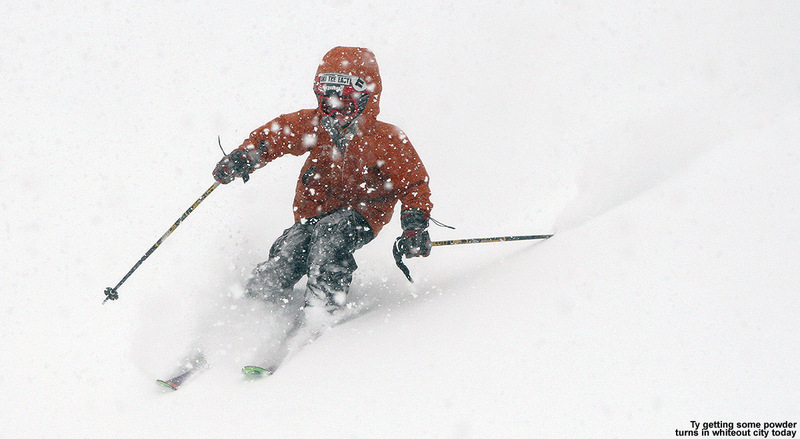 Everyone was pretty jazzed by those runs, as the quality of the powder was simply top notch. At one point Riley was blasting through the powder and shouted out “I love this real snow!”, since it was a bit of a change from what he is often riding on in New Jersey. 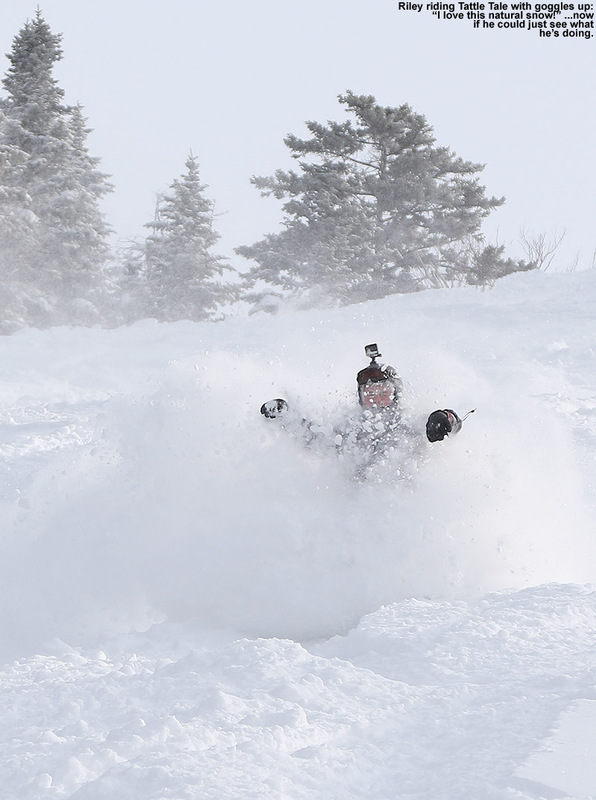 It took some getting used to taking on those face shots though, and he found out that riding without your goggles down is a good way to get a brain or face freeze from the powder billowing up there. 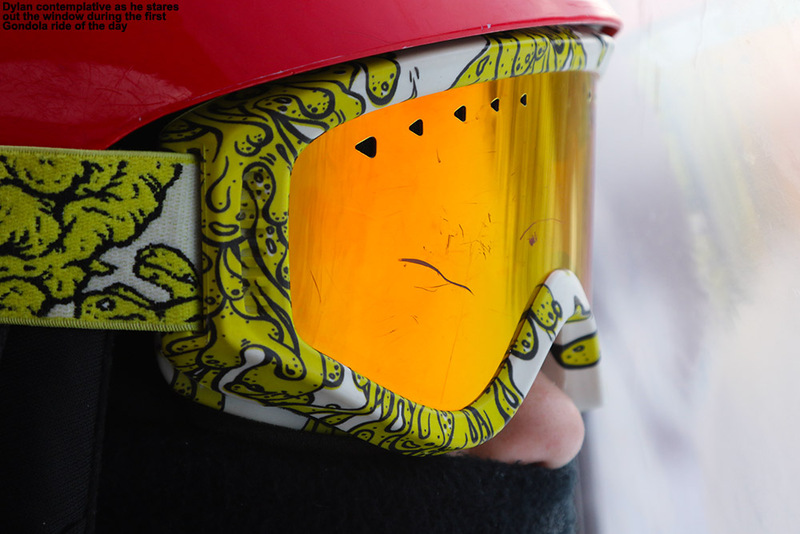 Riley got the photo of the morning though, with an image of him snowboarding with his goggles up and eyes closed as the powder blasted into his face. We headed to the main mountain next, and the kids were ready for a bit of warming in the lodge. We were upstairs when I got a call from Chris that he had arrived, and we let him know where to meet us. My goal was to get Tim and the kids over to Wilderness Woods for some mellow tree skiing, so we used the Vista Quad to connect over that way. There had been some traffic in there by that point, but the surface and subsurface snow were excellent and the kids really enjoyed poking around in there. People were starting to think about lunch, so we went back up Vista and did a long run down to Timberline. The trails were more tracked of course, but fresher snow could be found along the edges. The Timberline Lodge was really hoppin’, and it was one of the busiest days I’ve ever seen in there. The length of the line for the cafeteria suggested that it was a great day for the resort in that department. 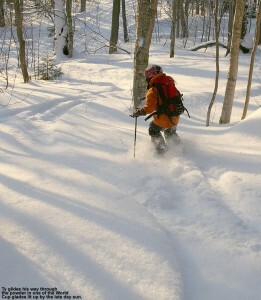 For the afternoon it was into the trees, with a couple of runs through various glades in the Wood’s Hole complex. 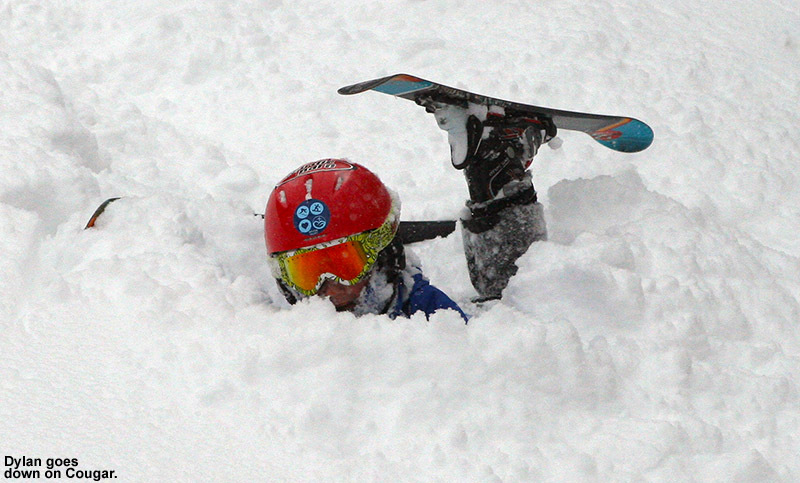 There was lots of deep snow, and Riley struggled at times if he got bogged down because he was on a snowboard. 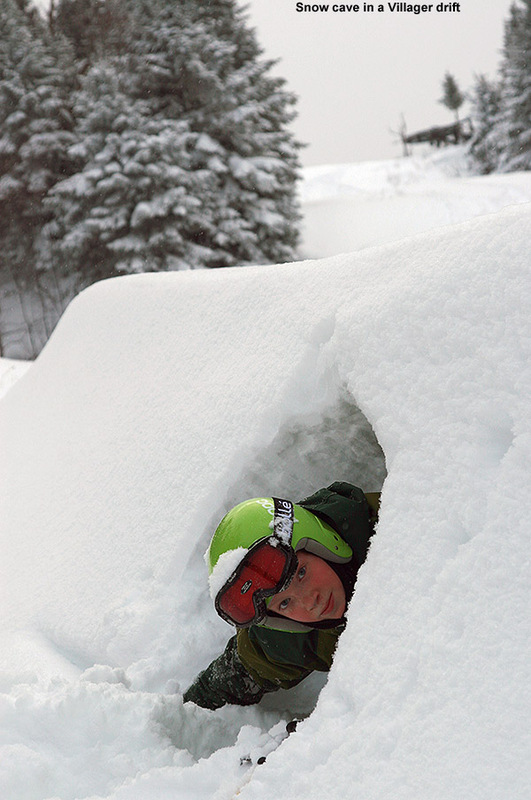 He got pretty frustrated and probably worn out from extracting himself from the powder, so he took a break in the lodge before he and Tim eventually decided to head back to the main mountain with the goal of letting him get some time in the terrain park. Dylan was just about done for the day after a couple of woods runs, but he joined Chris and me for one more in the KP Glades and he’s glad he did. 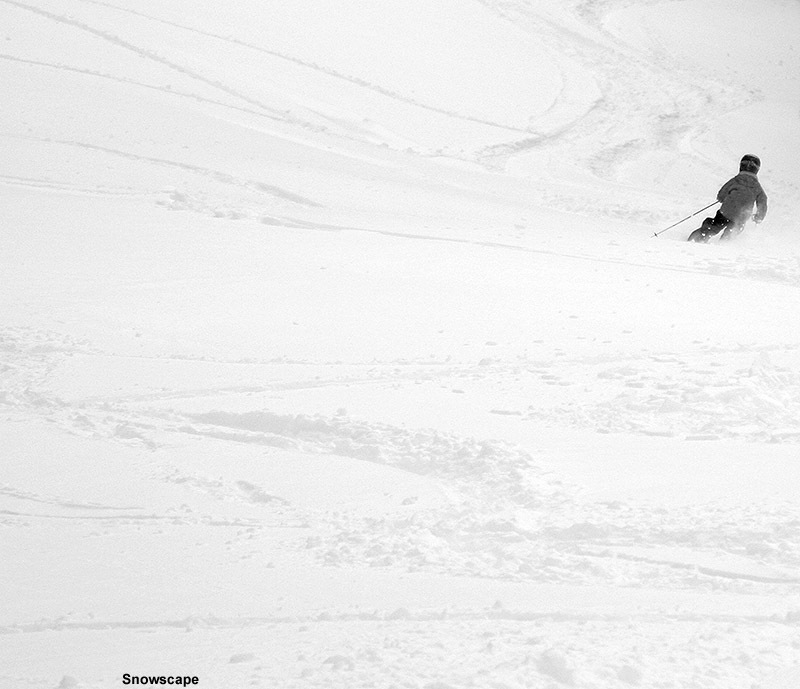 We found him a great line that produced some really deep turns and great photos. 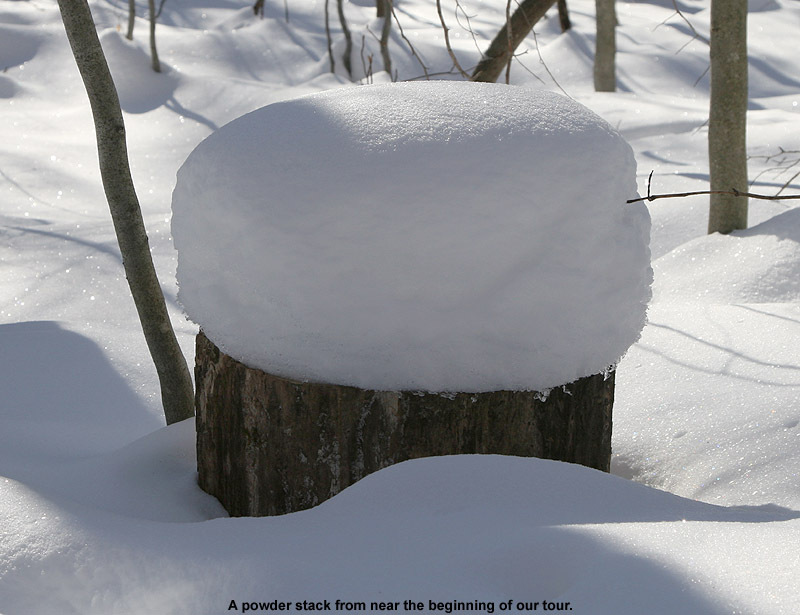 I checked the depth of the powder in there at around 2,000′ and found it at 29 inches. That’s bottomless. 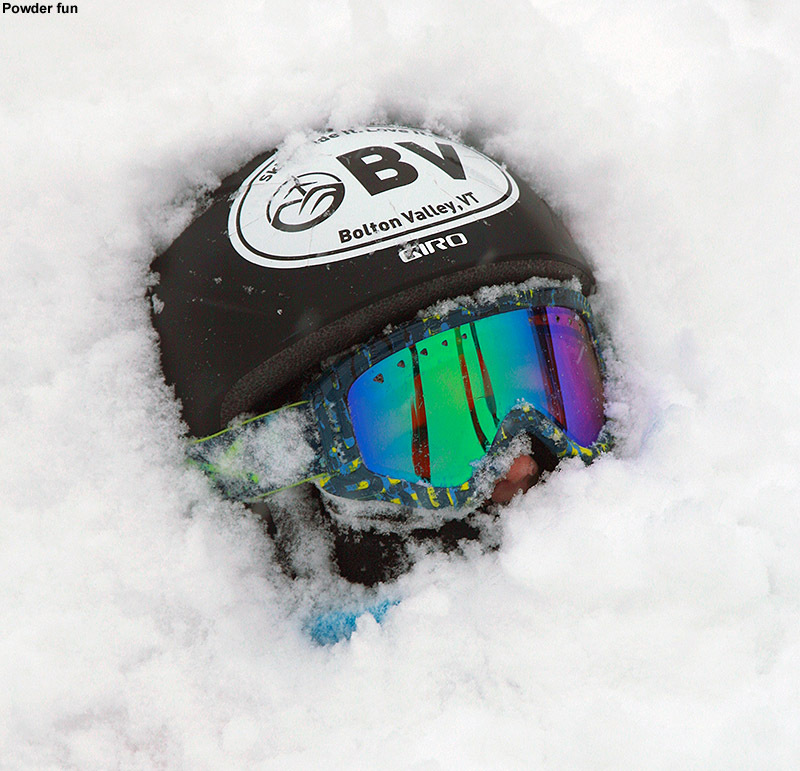 Dylan was even noticing how exceptionally deep the powder was, and he commented on how he could feel the way his fat skis were keeping him afloat. 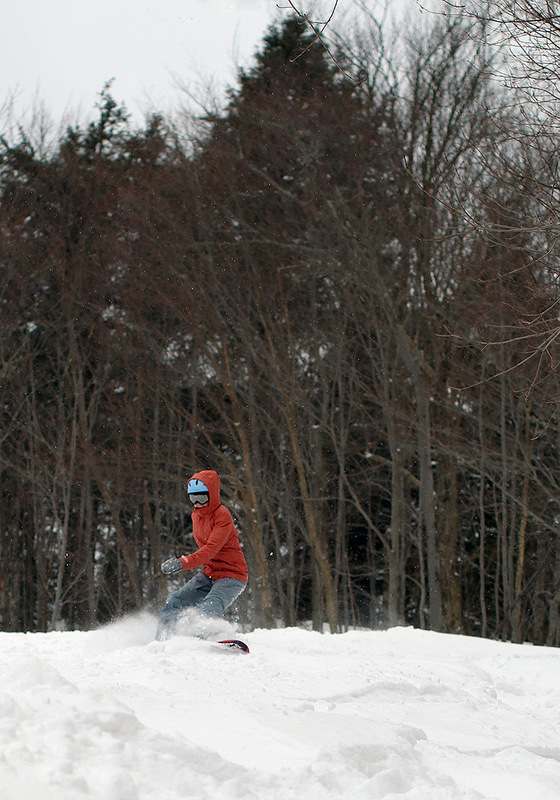 Dylan called it a day, but Chris and I went off for one more run in the Villager Trees. 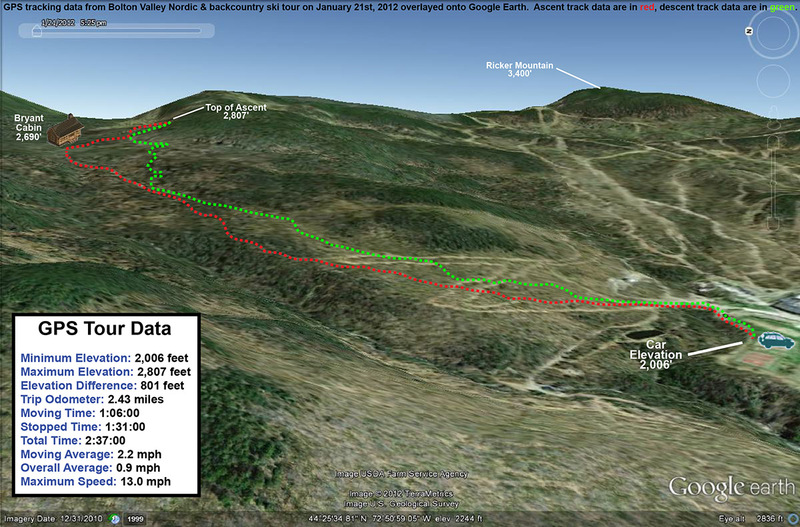 Up around the 2,700′ elevation level I measured 36 inches of powder above the base, so you can image how that run went. I’d definitely say that was the run of the day; it was very much fat ski city. 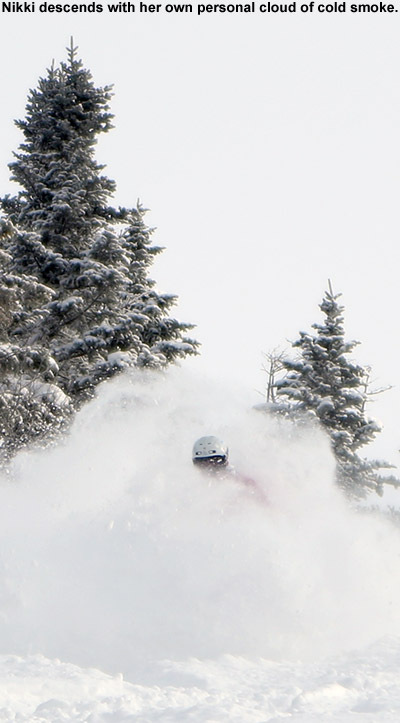 Floating through three feet of Vermont’s finest fluff was a great way to finish off the day, but Mother Nature apparently isn’t done with piling it on yet. A Winter Storm Warning begins at 1:00 A.M. tonight and there’s potentially another 12-18″ on the way thanks to Winter Storm Marcus, which is supposed to last for 3 or 4 days. 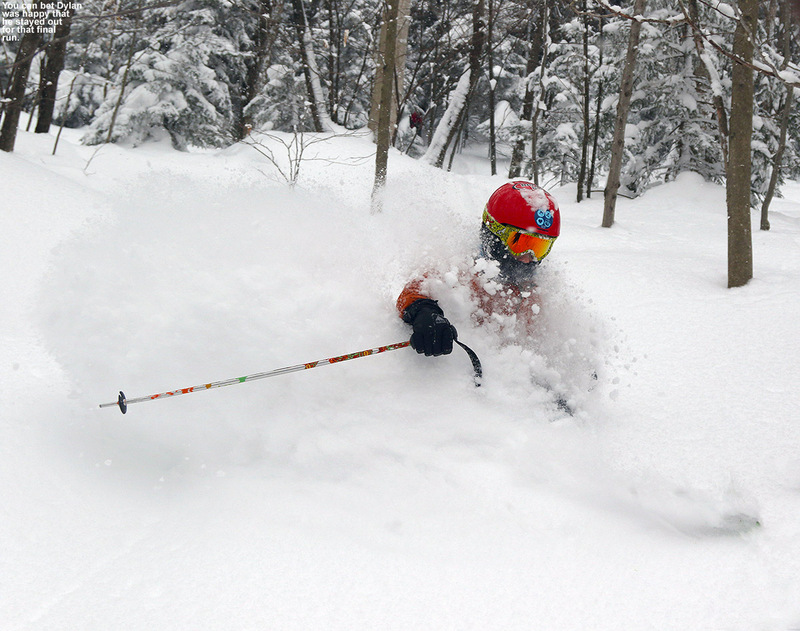 There’s noting like an impromptu dump of Champlain Powder. 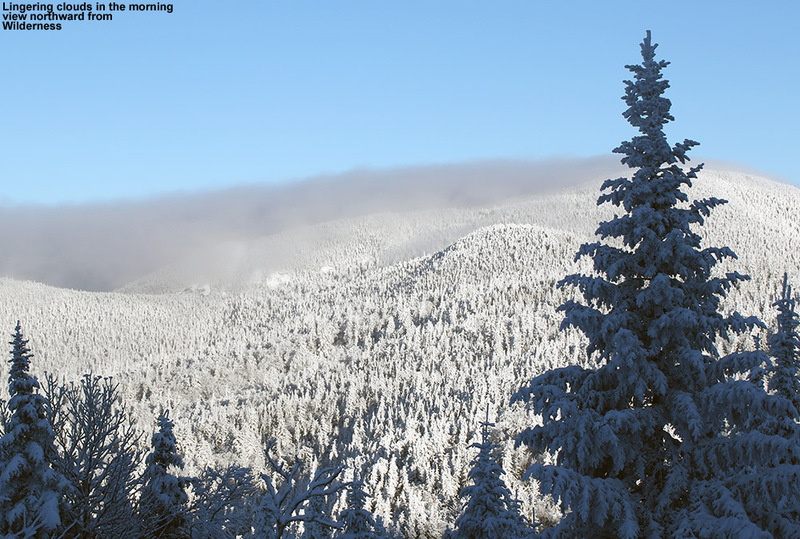 The overnight forecast called for the passage of an arctic cold front, with snowfall projections of 2-4″ for the mountain valleys and a bit more in the mountains themselves. That’s actually a decent accumulation for one of these arctic fronts, and with the way this winter season has gone, we should probably have a good feel for these things. This has felt like the season of arctic air; these fronts seem to come through every few days, and they just keep driving that midwinter cold into the area. It actually hasn’t been brutally oppressive, “high temperatures in the negative Fahrenheit numbers” type of cold, but it’s definitely been a sustained period of below normal temperatures with plenty of days hanging in the single digits. You know that’s been common when days with highs in the teens or even 20s F feel surprisingly warm. 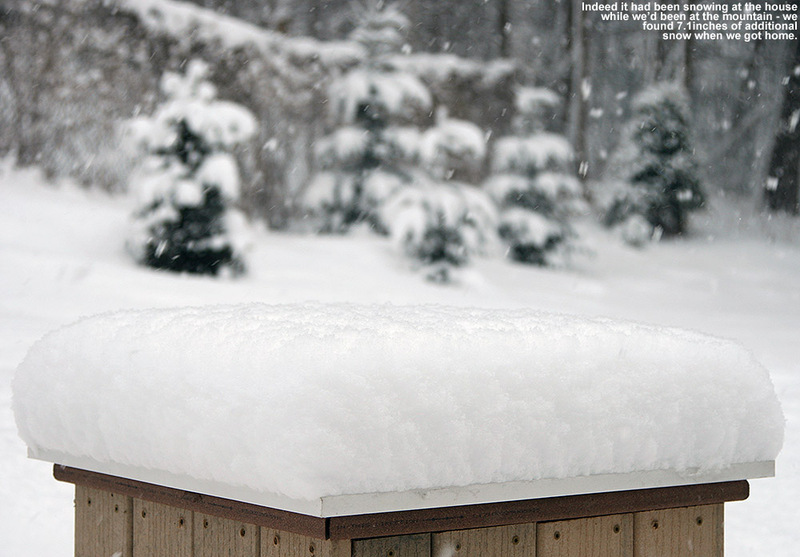 One huge upside of this cold has been the snow preservation – with the temperature never creeping above the freezing mark, each round of snow simply piles on another layer of fluff that works into the snow base. And as usual, each one of these fronts brings with it the chance for the Northern Greens to do their thing, i.e., pull a miraculous foot of Champlain Powder™ out of the sky, so it’s good to be at the ready each time these things approach. And, true to form, the mountains and cold air got together to work some of their magic overnight. 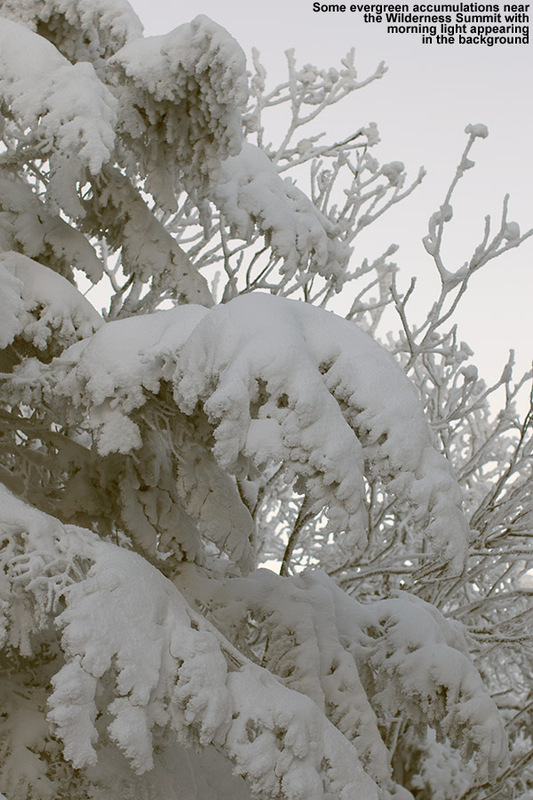 I woke up this morning to find that close to four inches of delicate, fluffy snow had fallen at our house in the valley. Just how dry was that snow? Well, my morning analysis of the snow for CoCoRaHS revealed a density of 4.3% H2O, which is indeed some “break out the bubbly” type of stuff. The snowfall must have really cranked up overnight, because when I looked outside around midnight there was just a dusting down. It seemed like such a short duration that I wondered how much snow could actually have fallen in the mountains during that time. It was early and I wasn’t sure if the snow report at Bolton Valley was even out yet, but four inches down here in the valley was definitely enough to get me interested in checking out what had fallen up on the hill. We actually had a bit of a respite from the more typical arctic air yesterday, and it was holding over into today with morning temperatures of mid teens F down at the house, and low teens when I arrived at the base of the Timberline area at Bolton Valley. There were three cars parked in the usual spot off to the right, and another car that had just followed me up the access road was parking as well. The skin track up Twice as Nice was in excellent shape, and it was consistently along the climbers left where it’s typically found. The resort had made one pass with the groomer on that side of the trail, which helped to make for a very easy ascent. I made depth checks throughout my climb, and got a surprising range of 6 to 12 inches of surface powder over a soft base below. 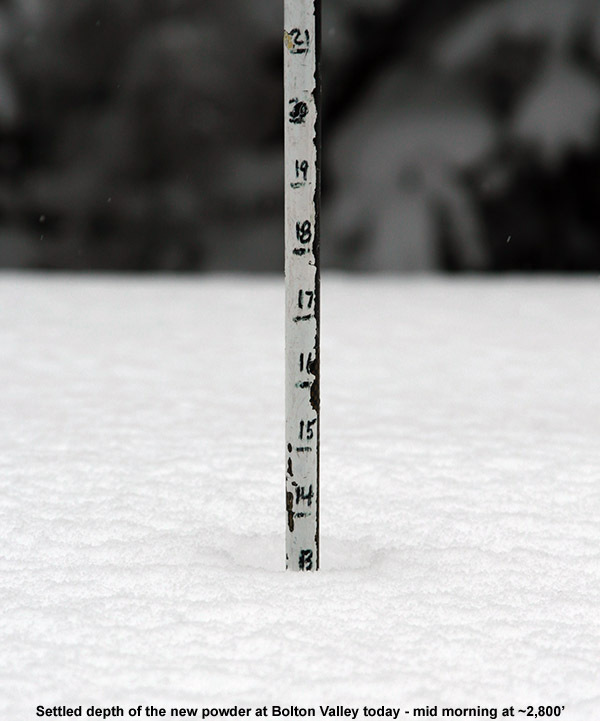 I was really surprised that I was getting measurements of a foot of snow, and even a bit more at times, because I didn’t think the mountain could have gotten that much in the previous few hours. But, the potential for skiing looked really good – there hadn’t been much in the way of wind, which is just the way you’d want it for maintenance of loft in champagne-style snow. As I approached the top of Twice as Nice, I watched a couple of skiers cut the first tracks down through it, and that definitely got me intrigued. 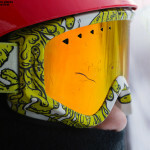 The powder skiing looked exceptionally sweet based on what I saw there. I took a quick look down Showtime from the Timberline Mid Station, but it appeared to have seen more grooming and I was soon headed back toward Twice as Nice; it sometimes gets hit by the wind, and this looked like one of those days where it seemed to have avoided that issue. 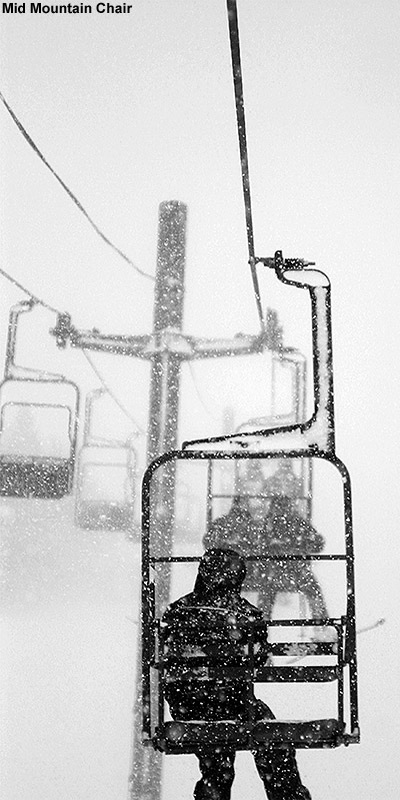 I finally began the descent, and whoa, indeed that snow was great – it was serious cold smoke. Being roughly in that ~4% H2O range as my analyses from the house indicated, the powder was actually so dry that even on 115 mm fat skis with close to a foot of it, the turns weren’t completely bottomless all the time. But, the quality of the subsurface was so good that even if you did touch down you’d be interacting with something that was still very soft. 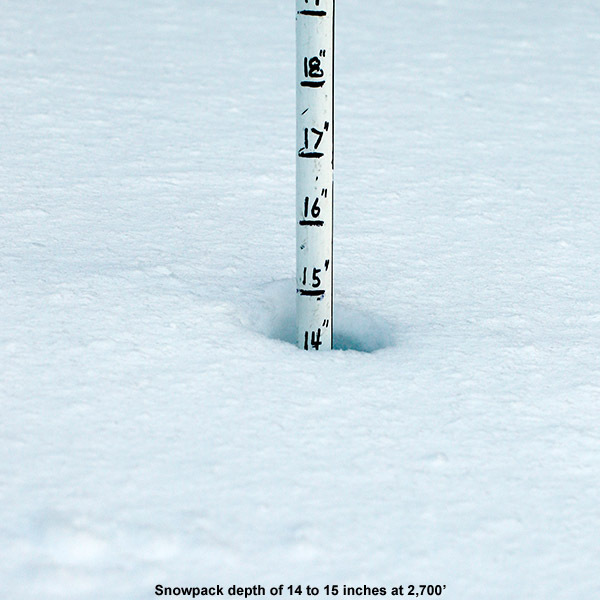 I made some additional depth measurements on my descent, and if I had to pin the overnight accumulation down to something tighter it would be 8-9″ at around 2,300′. 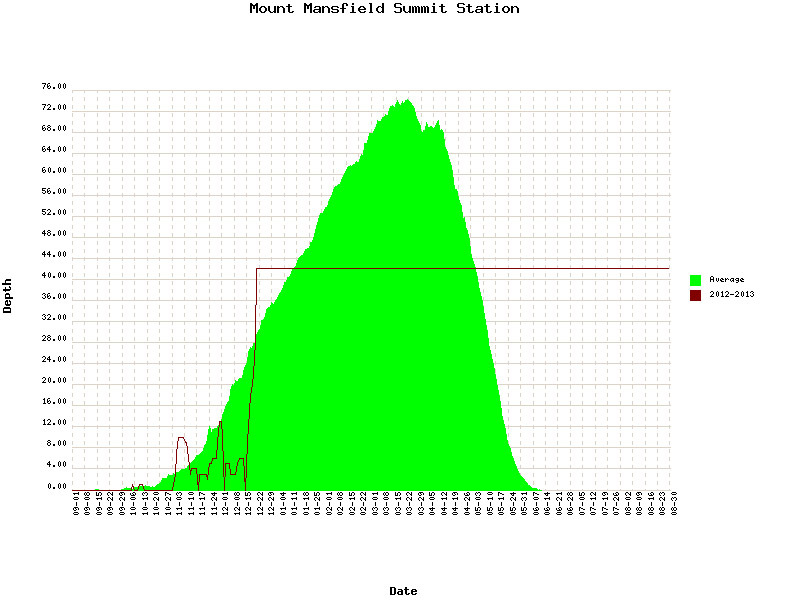 This was clearly one of those storms where the mountains got an elevation boost with respect to snow accumulations. When I finally did get a chance to check the snow report today, I found that Bolton, as well as the other resorts along the spine of the Northern Greens were reporting close to a foot of fresh snow, with lower numbers in the Central and Southern Greens. 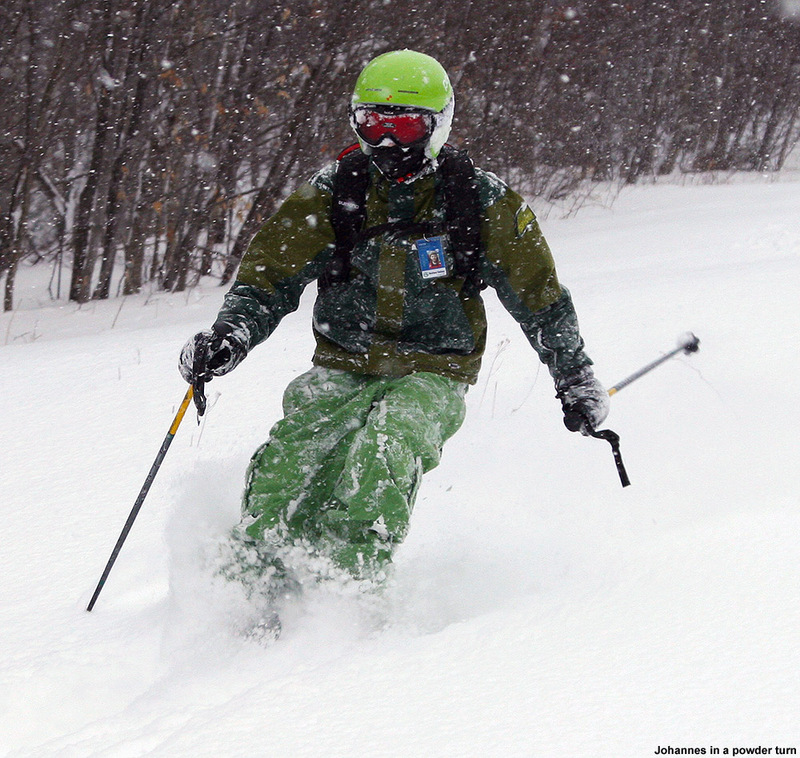 So although the air has been on the cold side over the past few weeks, I don’t think you’ll hear too many skiers complaining about any of these arctic fronts that come with a foot of fresh. 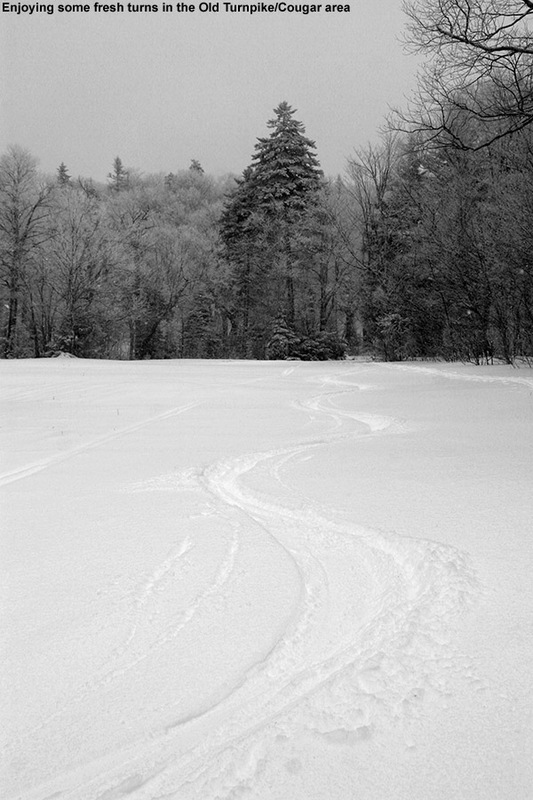 Tracks on Spell Binder – sometimes you can tell the quality of the snow just by the ski tracks. The upslope snow that started yesterday really delivered in the evening, and we got to witness it first hand as we drove off to a Christmas party in the Champlain Valley. We almost turned around right at the house as the snow was coming down at 2 inches an hour or more, and we could only see a few yards in front of the car. Fortunately that tapered off a couple miles to our west, but in the end we wound up with 9.5 inches of upslope fluff at the house, and Bolton Valley probably had over a foot, bringing them to 30 inches of snow in the past week. This snow was some incredibly high quality Champlain Powder™ to boot, with my snow density analyses coming in at 2 to 3% H2O. This morning we got up to the resort around 9:00 A.M., and similar to yesterday the scene was fairly mellow – after dropping off E and the boys I was able to park in the third tier of the main lot. We started off with a run down Alta Vista, and it was E’s first chance to try out her Black Diamond Element skis, which are the women’s version of the AMPerage. I warned her that unlike my first experience with the AMPerages, which was entirely under powder conditions, she might not be that impressed with how they skied on the groomed areas before we made our way to the powder. Indeed she was very unimpressed, noting that there was so much ski width (115 mm at the waist) that she couldn’t even get them on edge. 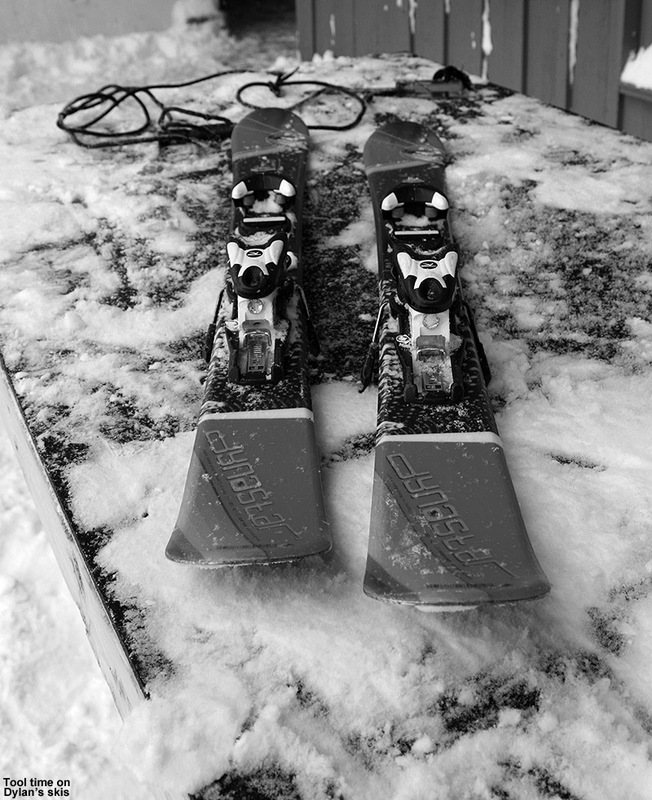 I hadn’t found that to be an issue for me with the AMPerages, so it could certainly be attributed to a difference in our ski styles, but I think it questions again the potential for these skis to serve as a one ski quiver for all surfaces. We got them as our backcountry/powder Telemark skis anyway, but it will be interesting to see how our usage patterns develop; being more comfortable on them so far, I might take them out on more marginal lift-served powder days, where E might stick with her narrower Telemark skis. E did point out that her Telemark ski boots are a bit loose, and she could feel the slip in them today due to the thinner socks she was wearing. Having that slip in there may make it challenging to get the pressure necessary to roll these fat skis on edge on groomed surfaces, so we’ll have to see if a better boot fit helps out, or if there’s going to be an adjustment period due to something else. We made our way over to Wilderness and got into some powder, and not surprisingly, E didn’t have any issues with the skis there. 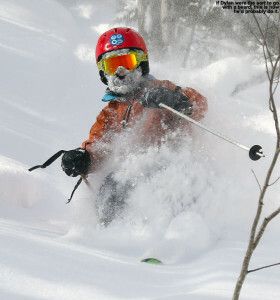 But, neither did she find them to be as amazing in the powder as I had on my previous outings. Of course we were skiing in roughly a foot of amazingly dry snow over a well consolidated base, so almost any ski could handle it. 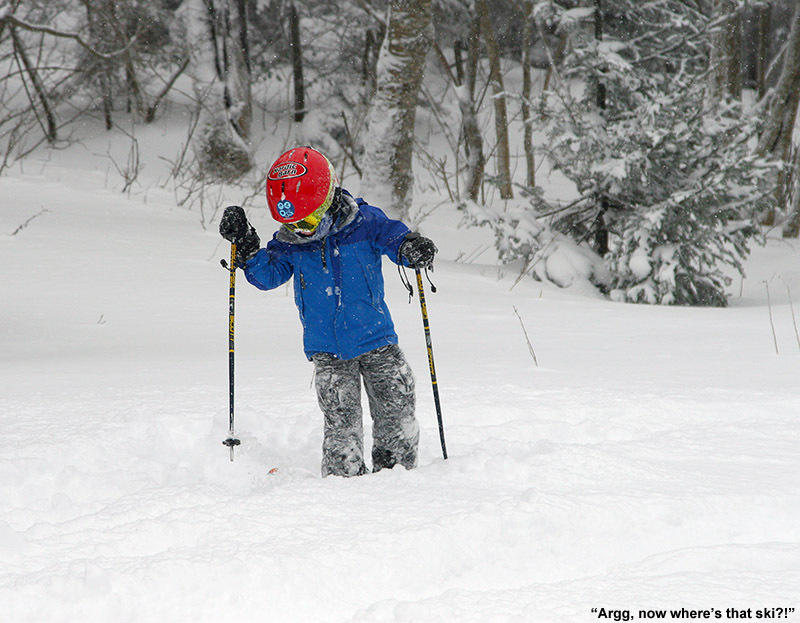 We enjoyed lots of fresh turns on Lower Turnpike, and it was a bit slow with the modest pitch and all the powder, but the boys had a great time. 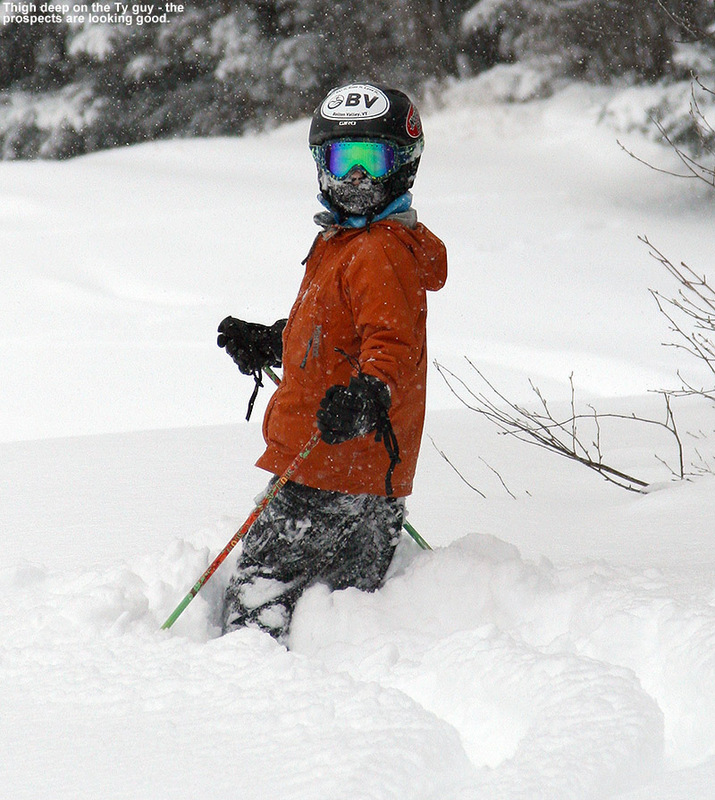 Ty had an especially fun time straight lining sections of the powder. 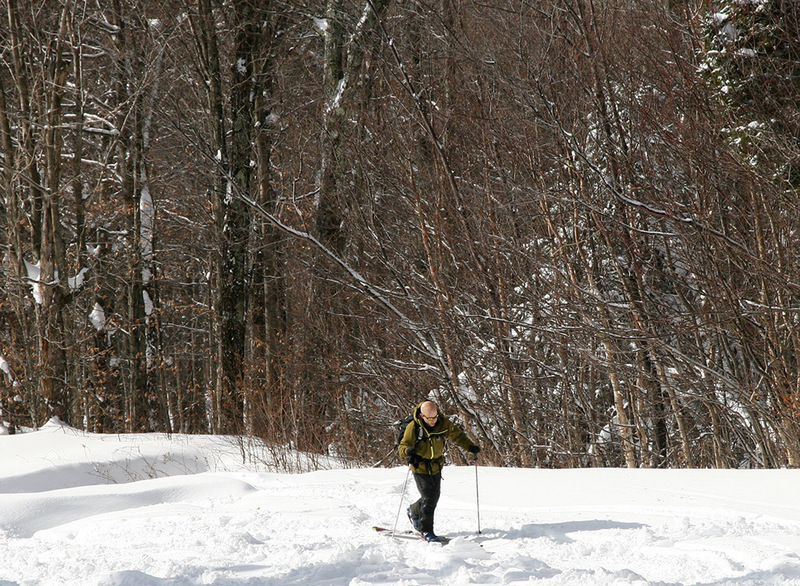 We also jumped into Wilderness Woods, which were being skied extensively – they’re certainly skiable, although you still needed to be somewhat cautious to avoid underlying objects. On that note, the Mt. 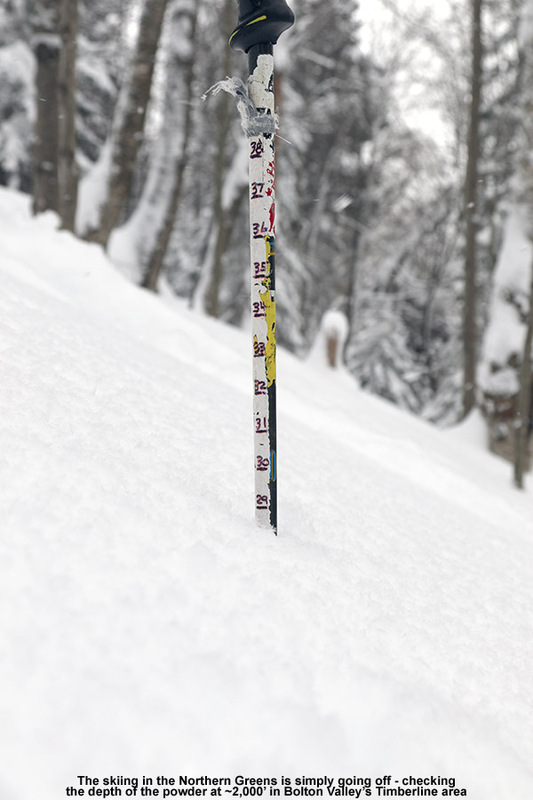 Mansfield Stake hit 28” inches yesterday, passing the magic 24” mark that I’ve used as a measure of when those initial forays into the trees begin. Bolton even opened steep tree areas like Devil’s Playground today, so many trees are definitely ready for skiing if patrol deems areas like that acceptable. We headed for the same route again on the next run at Ty’s request, but wound up taking the Wilderness Lift Line when Dylan led us that way. 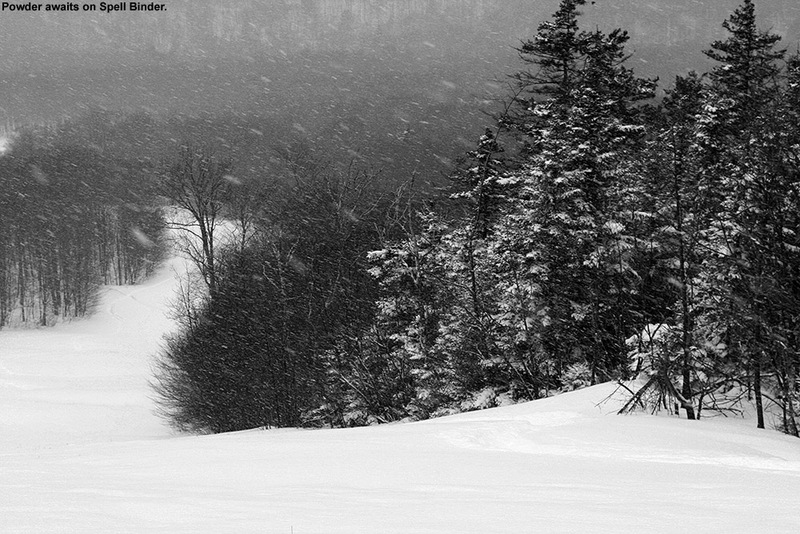 Conditions along the edges still offered up plenty of nice turns though. The boys were calling for an early lunch after those two runs, so we headed into the lodge, and eventually got a call from Stephen that he and the kids had finally made it to the mountain. We finished up our lunch and met up with Helena and Johannes to take a run while Stephen picked up his skis from the ski shop. We opted for the standard Sherman’s Pass route to let Helena and Johannes warm up. Surfaces were decent packed powder aside from wind-exposed areas, which were blasted down to whatever nasty hard surface lay below. When we all got back together we hit Lower Turnpike again, and it felt much faster that second time. 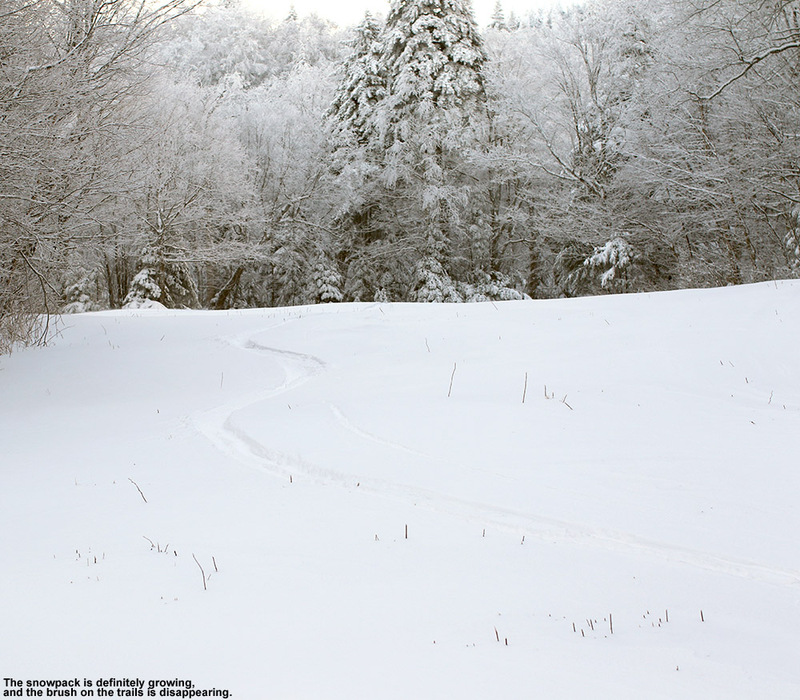 There were a few more tracks around to let you gain your speed, but somehow it was more than that. 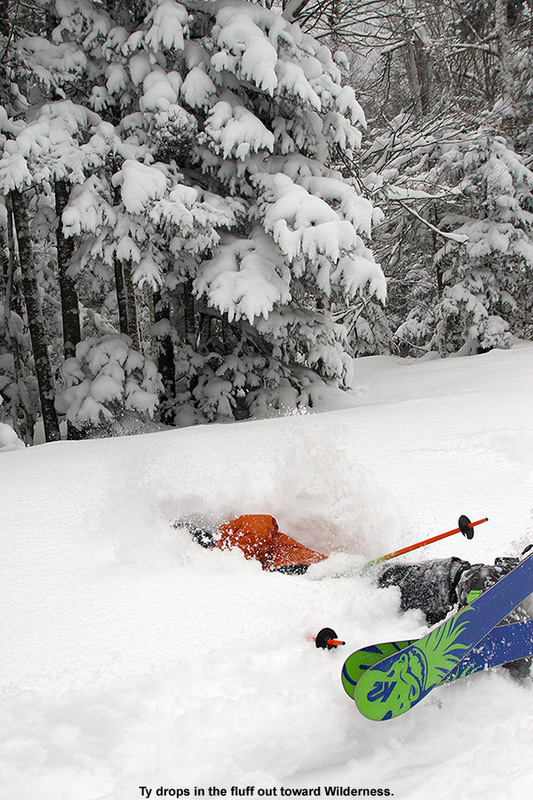 Whatever the case, the turns were smooth and silky in the powder. Johannes and Helena needed their lunch break by that point, so while they went in the lodge, E and the boys and I went back for another round. Dylan and I came in at a higher entrance and got some bonus fresh turns. We had spotted a car over at Timberline on our way up to the resort, with the intent of finishing off the day there, but Dylan was pretty beat, so E decided that they would drive down and meet Ty and me there. Johannes had enough energy, so he joined Ty and me for the trip. Aside from windblown areas, which were reduced thanks to the lower elevation, the snow was simply amazing at Timberline as is typical for these types of events. 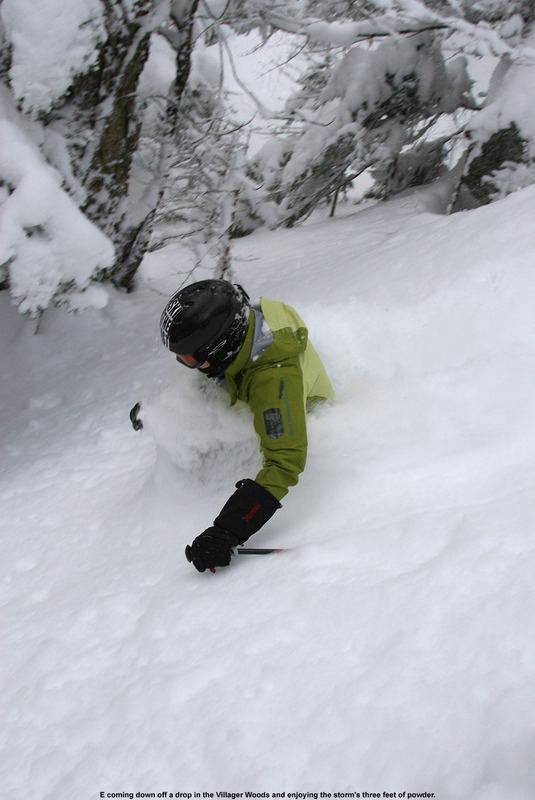 We found a foot plus of Champlain Powder™ over a consolidated base – and it was more than enough to be bottomless, even on the Spell Binder headwall as long as you stuck to the skier’s right. 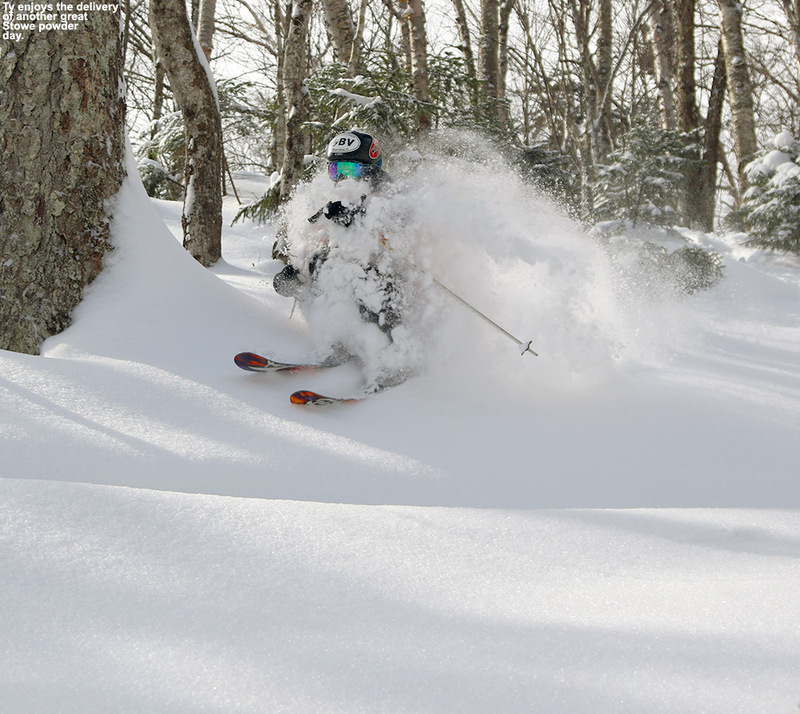 That’s some pretty primo skiing. The only part to avoid was the bulk of the headwall section with sastrugi (or “fake powder” as it often looked today) from the winds. Both boys did well, and we made reasonable time down to the car, with the requisite photo sessions as well. Dylan missed some great turns, but he was certainly tired – while E was out getting a couple of final things for the holiday in the evening, I found that Dylan had gone and tucked himself into our bed and gone to sleep. I was worried about the cold today due to the potential wind chill, but it turned out to be a fine day with temperatures in the 20s F and only minor breezes. We’ve got more snow falling tonight with the potential for four more storms to pass through the area this week. 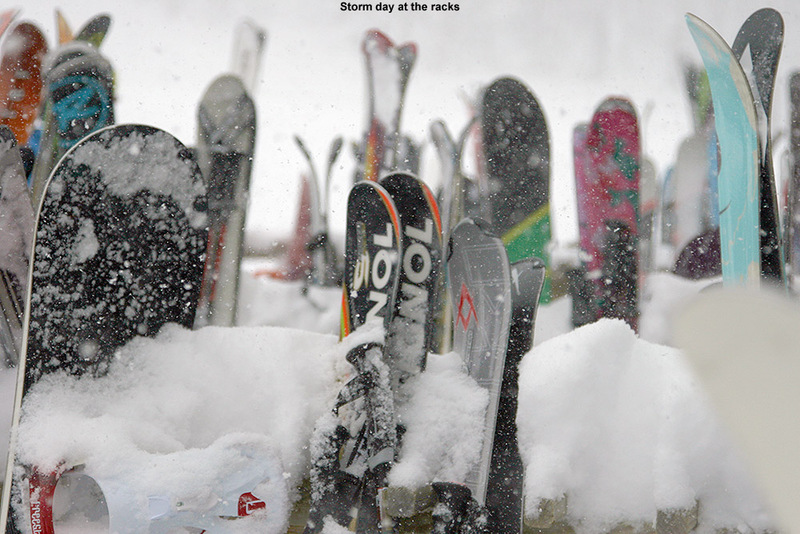 It could be an excellent holiday period for skiing if the potential storms hit our area as snow. The mountain is already opening up lots of natural snow terrain, so the snowpack is building with the weather pattern we’re in. The Mt. 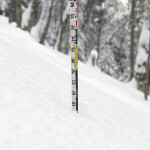 Mansfield Stake just hit 42” today, and that is a sign that off piste skiing should be well under way. 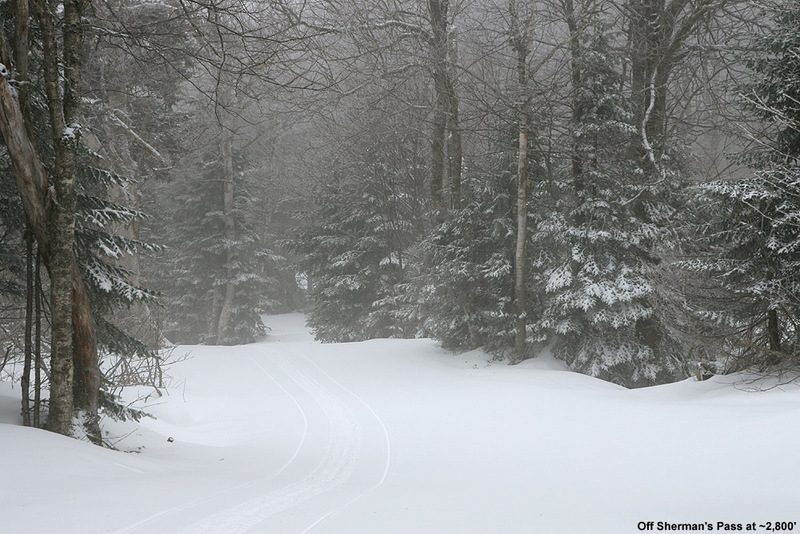 We’re currently in the midst of what could be one of our largest snowstorms of the season here in Northern Vermont, with multiple feet of snow possible for the higher elevations along the spine of the Greens. Earlier this week, the mountains already picked up about a foot of snow from the combination of two storms, one on Tuesday/Wednesday, and another on Thursday, so a substantial dump from this storm will really have conditions going off. The current storm actually started up in this area midday yesterday, and I saw a fresh inch of snow on the ground in Burlington when I left around 4:00 P.M. We’d received up a couple of inches of snow at the house as of 6:00 P.M., and thanks to inch an hour snowfall, we picked up another quick couple of inches through 8:00 P.M. before the precipitation tapered off overnight. This morning, temperatures were around the freezing mark down in the valley, and little snow was actually falling at our house, but the mountains were getting pounded with upslope flakes. 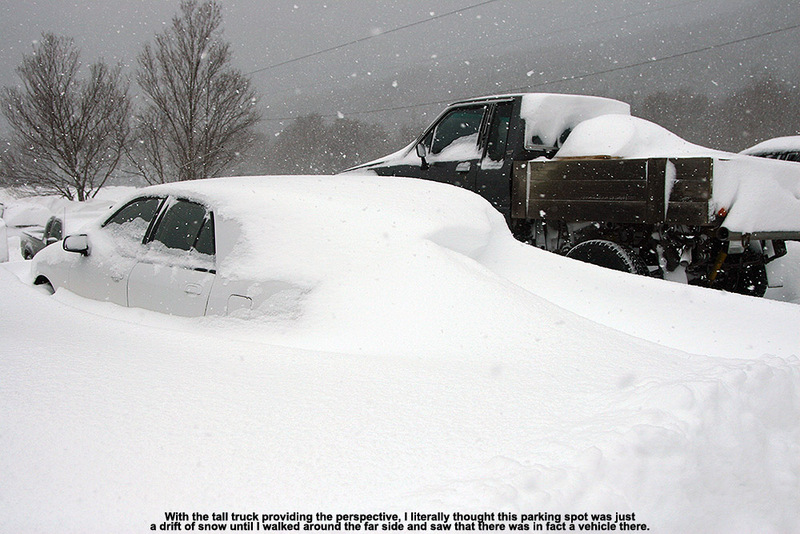 Powderfreak sent in a report to Americanwx.com this morning indicating that it was a total whiteout at Stowe Mountain Resort. So much snow had fallen overnight that snowmobiles and even snowcats were having difficulty getting up the mountain. The upslope power of the Northern Greens was in full effect. 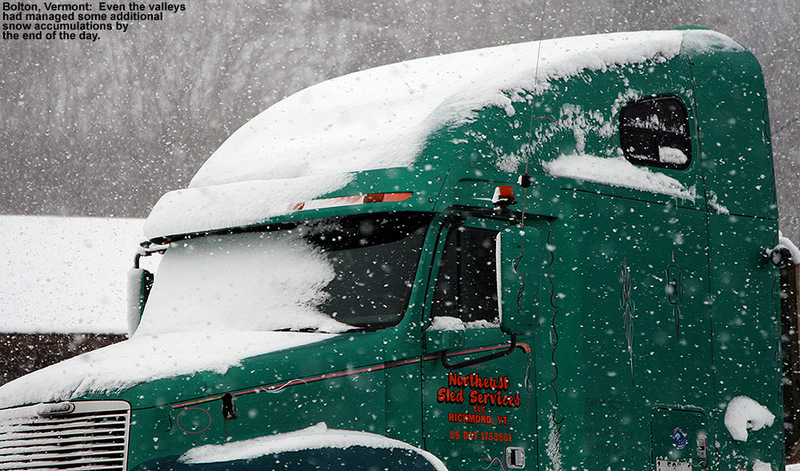 Ascending into the higher elevations of Northern Vermont today revealed a world of heavy snowfall and challenging driving conditions. 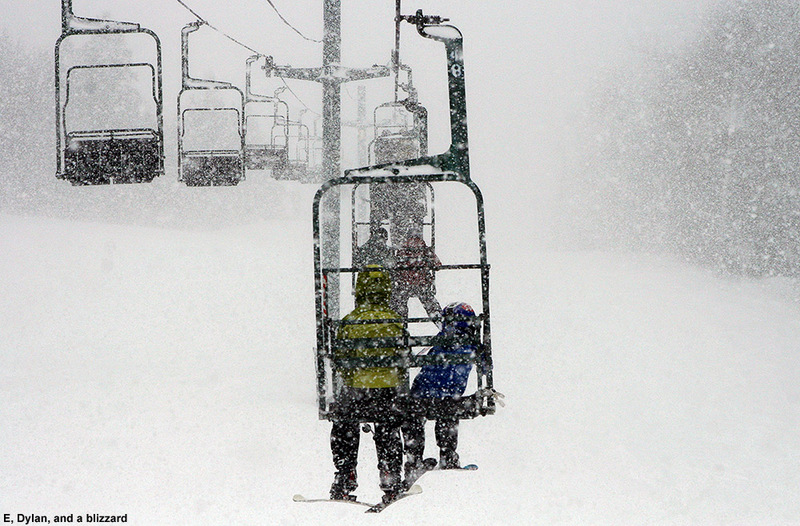 Not surprisingly, heavy snowfall was hitting Bolton Valley as well, but high winds meant that all the chairlifts were on wind hold at the resort, and employees were stationed at the bottom of the Bolton Valley Access Road to save people the hassle of driving up if they didn’t know about the weather delays. We’d all brought our Telemark skis and skins and were planning to earn turns as needed, so when we reached the bottom of the access road we let the employees know that we’d be earning turns and they waved us through. Having old tires with minimal tread, even the Subaru struggled to get up the steep S-curve on the access road this morning, and a big part of that was because the snow was falling so quickly that the plows couldn’t really keep up. Fortunately, we were able to get up to the Village safely. 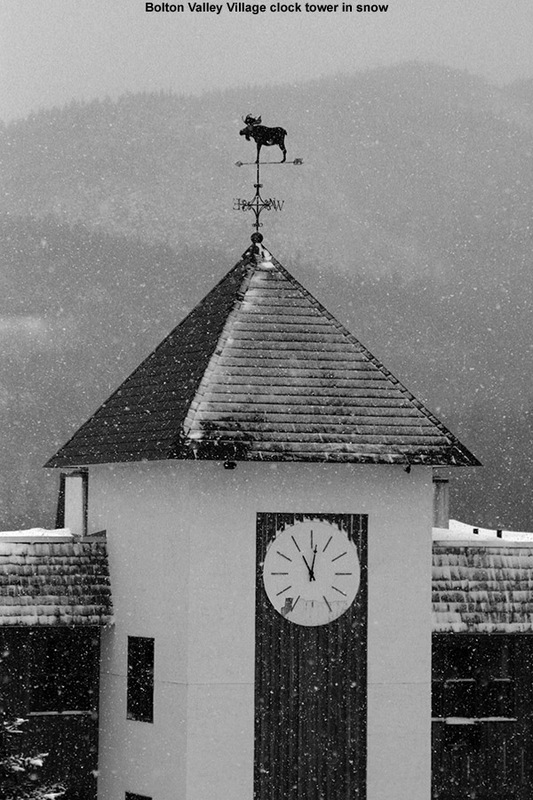 The snow was indeed falling very heavily up above 2,000’ in the Village; I’d estimate that was coming down in the range of 1 to 3 inches per hour. 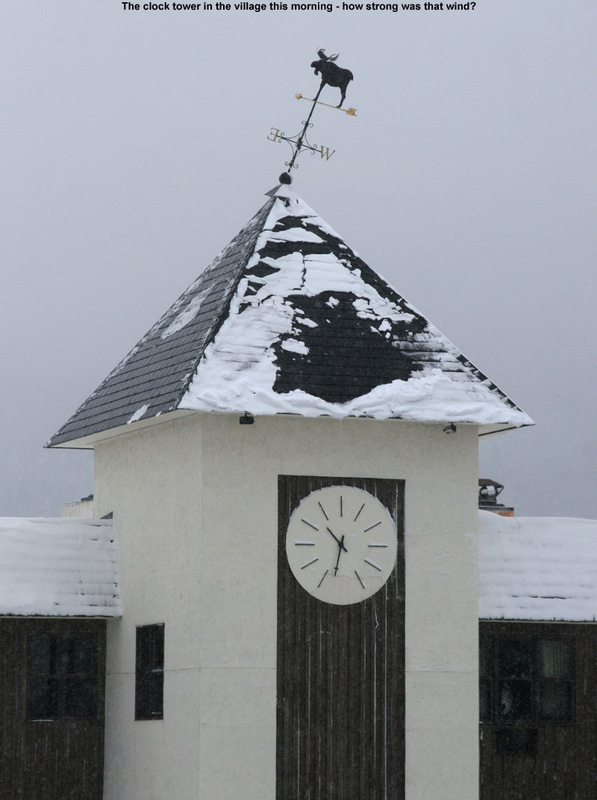 When we finally arrived up in the Bolton Valley Village this morning, we were greeted by snowfall pounding down at rates of 1 to 3 inches per hour. 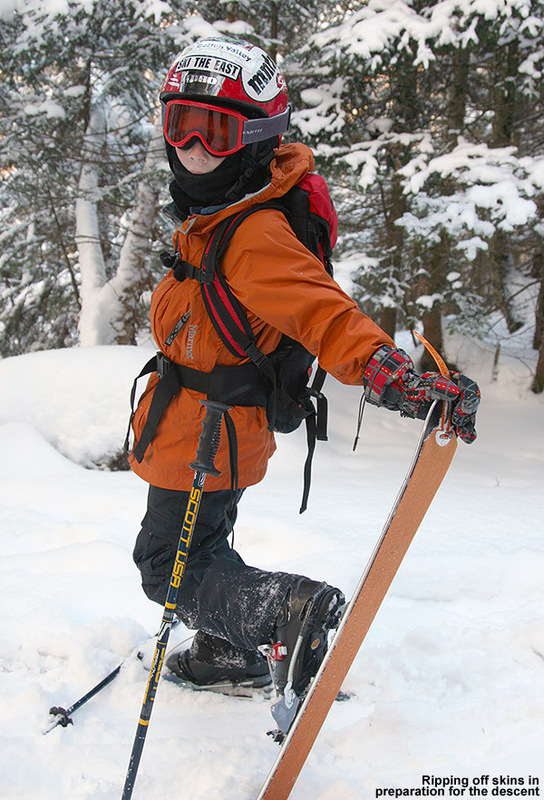 Dylan had to use the restroom right when we arrived in the Village, so E and the boys headed up to the base lodge quickly with some of the Telemark gear, while I finished suiting up and got the rest of the gear together. Just as I was about to head up to the lodge as well, I got a call from E that the Mid Mountain Lift was running, so I grabbed the boys’ alpine gear for them to use. 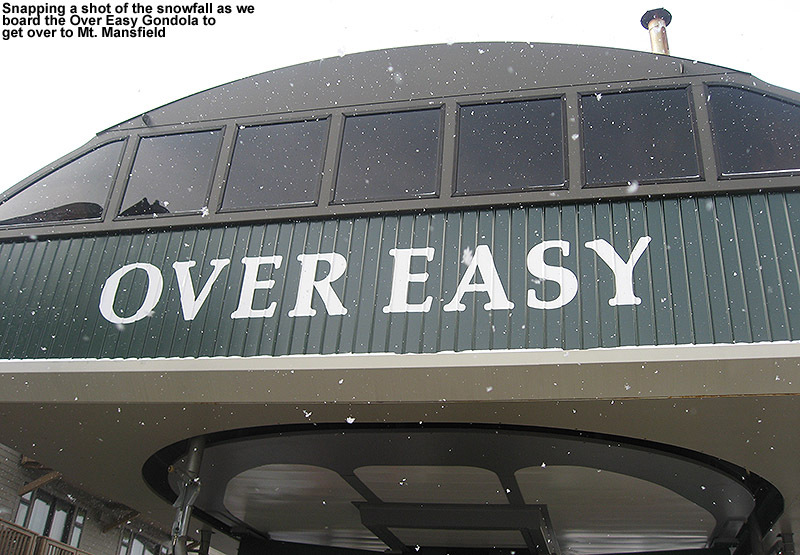 It was quite a load with three pairs of skis, two pairs of poles, and a couple sets of boots, but I managed to get everything up to the lodge, and indeed the Mid Mountain Lift was humming along serving at least a little vertical to happy skiers and riders. Dylan’s stomach was bothering him a bit, so E hung out inside with him while Ty and I headed out for a few Mid Mountain runs. Outside the lodge at the ski racks, we met up with Jason, who had just come down from Wilderness with another one of the instructors. He said there was indeed a lot of snow up there in the higher elevations – enough that you wanted to stick to terrain with good pitch if possible. 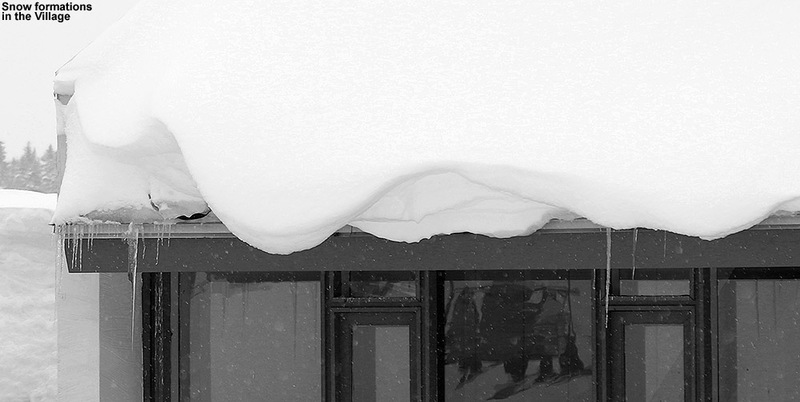 The wind was also strong, so that was having an effect on the distribution of the snow. Heading to the upper mountain would have been my plan as well, but it’s still a lot of work for the boys at this stage, so sticking to lift-served terrain on the bottom half of the mountain was the way to go. We’re already very excited about how far the boys have come in terms of ascending for skiing, but it’s going to be fun to see what things are like as their skills and stamina continue to increase. 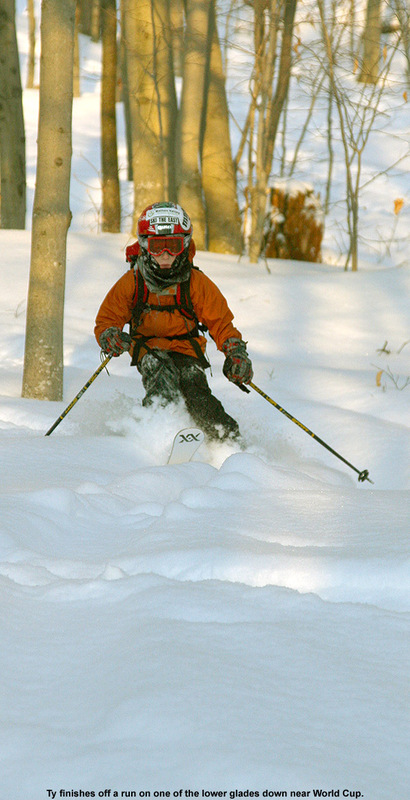 Ty suggested Enchanted Forest for our first run off Mid Mountain, and the snow was excellent, but only the steepest spots were really good for skiing in the deep powder, so we headed back to Beech Seal to finish off the run. Acknowledging the need for steeper pitches, I took Ty over to the Butterscotch Terrain Park via Deer Run. We did get some nice turns in the park on the steep pitches on the back side of the features, but some of the best turns were actually on that steep pitch where Deer Run drops down to Sprig O’ Pine. Unfortunately I didn’t get any photos there, but I pulled out the camera and got some nice shots of Ty skiing of the terrain park features amidst the very heavy snowfall. The intense snowfall from the storm was lots of fun to witness, but the strong winds that came with it were much less enjoyable. 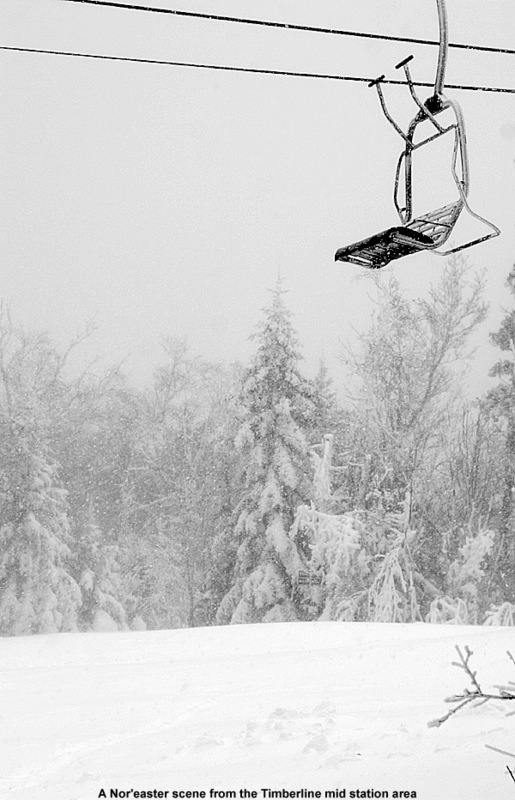 The winds were from the west/northwest, so riding the chair was no problem, but they really bit into you when you headed down the west-facing runs. Thus it wasn’t too long before Ty and I were ready for a lunch break. Dylan had actually fallen asleep while we’d been outside, but he woke up once we were back inside; he was feeling much better and was ready for lunch. We headed upstairs and had lunch near the Fireside Flatbread area; crowds were pretty minimal with so many people being turned back at the base of the access road, so it was very quiet up there. The four of us headed back out for a few more runs after lunch, starting with a run down Glades since Ty and I hadn’t checked it out earlier. The steeper terrain at the top was sufficient for some decent powder skiing, although that meant that it was getting plenty of traffic, so fresh tracks were a little harder to come by. We also checked out Beech Seal, since it’s got reasonably steep terrain at the top. 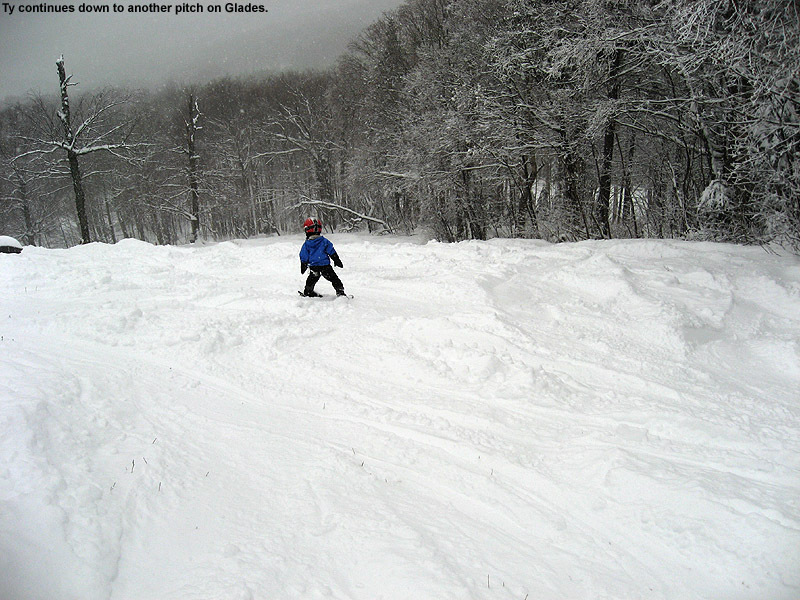 It was also fine for turns, but it’s pretty exposed to the west wind and that took away from the experience. It continued to snow, so it was hard to pull away from the slopes, but the wind was unabated and we eventually decided it was time to take off the skis and save some energy for tomorrow, which looks like it’s going to be a memorable one. We had also promised the boys that they could do some swimming at the sports center after they skied, so they were anxious to get down to the pool. The pool at the sports center was hopping with many visitors that had decided to stay inside out of the storm, and while E and the boys swam, I took the opportunity to tour around the Village and get some photographs of the snow. 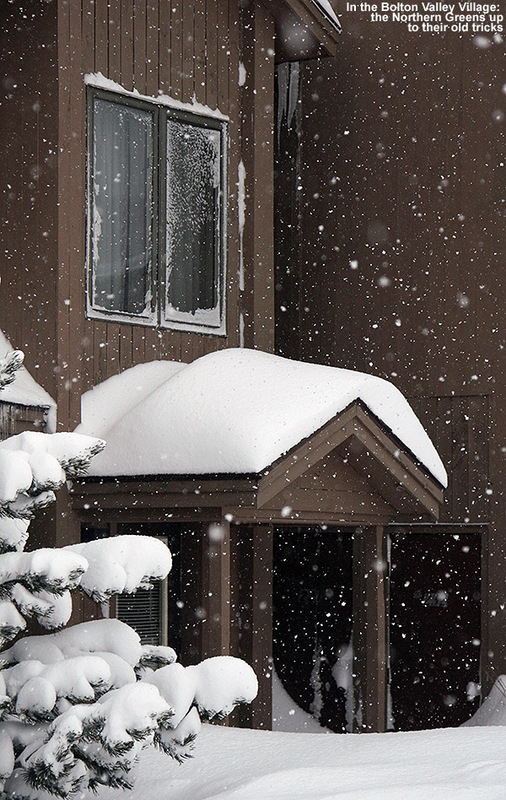 I got some great images of where the fluffy Champlain Powder™ had accumulated with fantastic loft in sheltered locations such as on the leeward side of the Courtside 2 Condos, and in other spots I got some cool shots of the dramatic drifting caused by the wind. 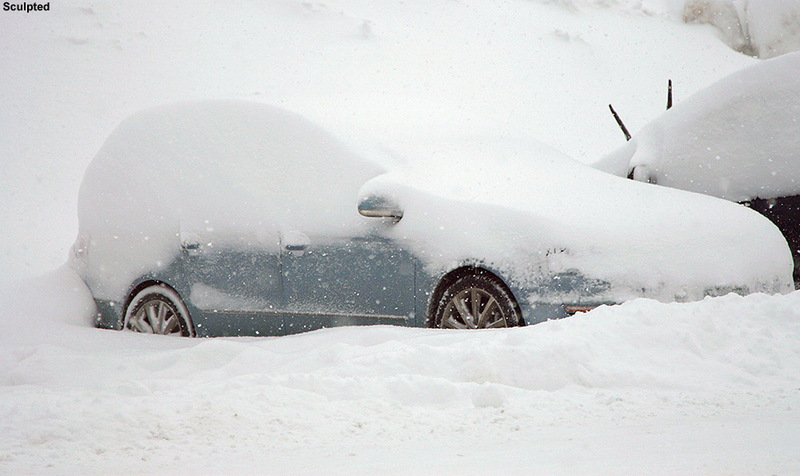 I found cars in the parking lots that sat through the whole storm and had virtually disappeared beneath the snow. 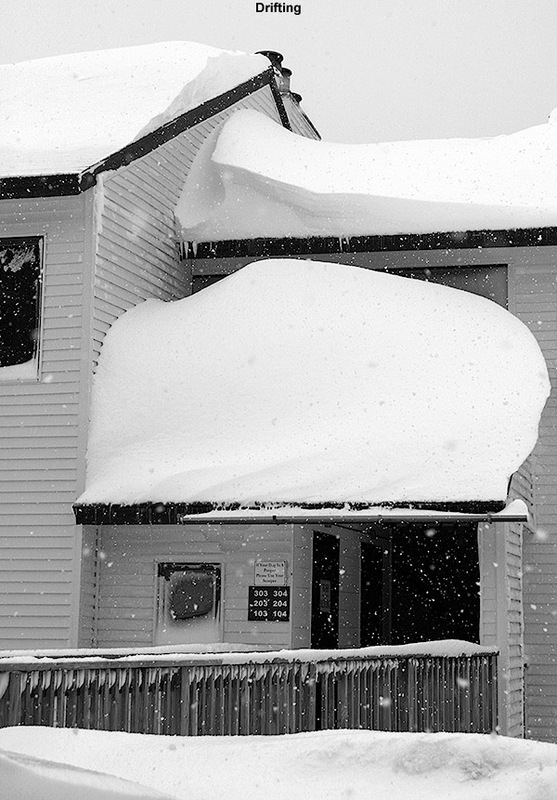 Even in some of those drifted areas though, the snow often managed to retain incredible loft. 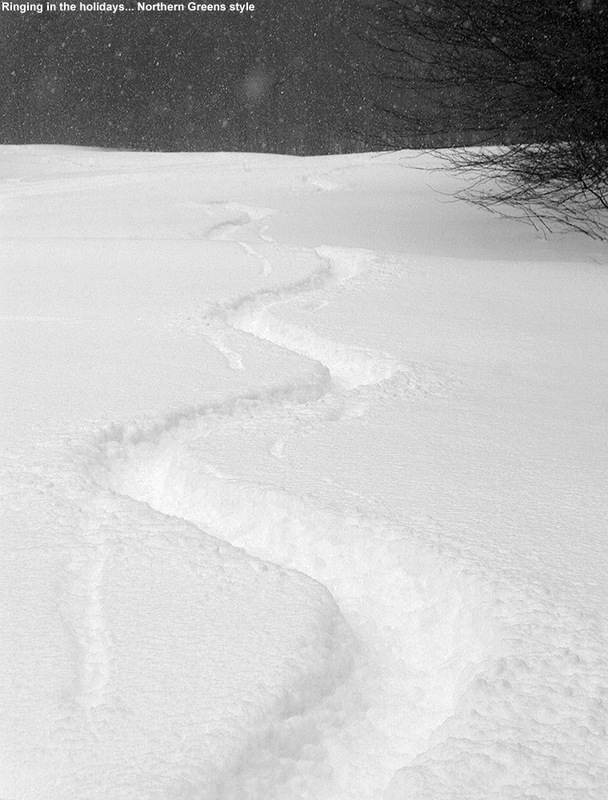 One could walk through some waist or chest deep drifted areas where the snow would simply dissolve around you as you went through it. The snow was actually letting up for a time while I toured around the Village, and there were some points where it almost appeared as though the storm was over, but it always seemed to make a resurgence. 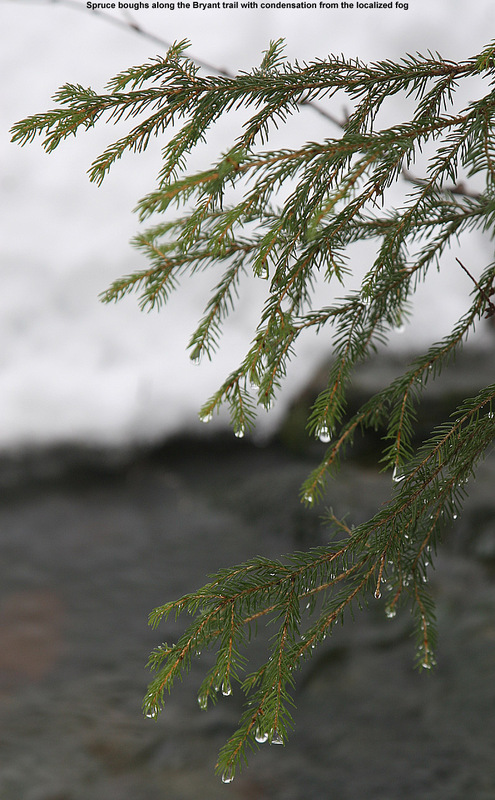 The breaks in the blizzard-like conditions certainly helped with the photography though. At the end of the afternoon, our descent of the access road was much easier than the ascent had been; the snow wasn’t falling quite as hard, so presumably the plows could keep pace. When we’d left the house earlier in the day, it wasn’t really snowing, so we were very curious to see if anything had gone on down in the valley while we were away. That question was answered pretty quickly when we found that the snow in the driveway was now a foot deep, and 7.1 inches of new snow had accumulated on the snowboard while we were at the mountain. 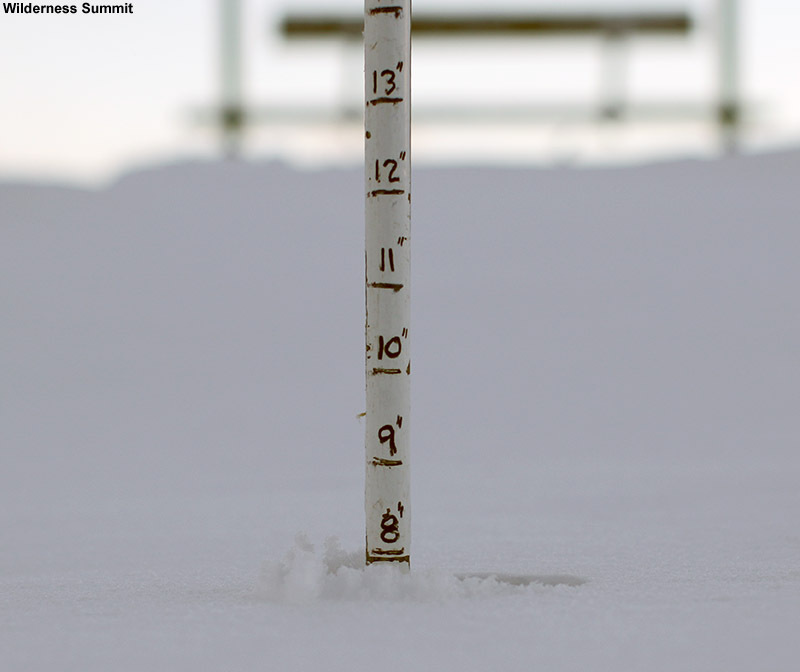 I took a core sample from atop the snowboard and the snow came in at a density of 3.8% H2O. 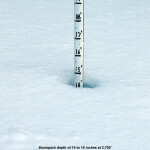 But the storm isn’t done delivering Champlain Powder™ just yet; through 10:30 P.M. this evening we picked up an additional 8.4 inches of 2.1% H2O powder, and it’s still going. 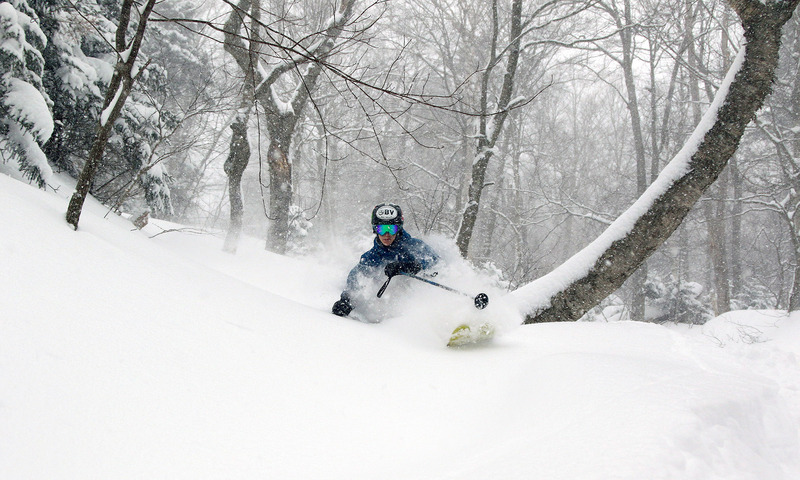 We’ve now received over 20 inches from this storm down here in the valley, and the mountains will likely double that amount; it looks like tomorrow at Stowe is going to be simply off the hook! 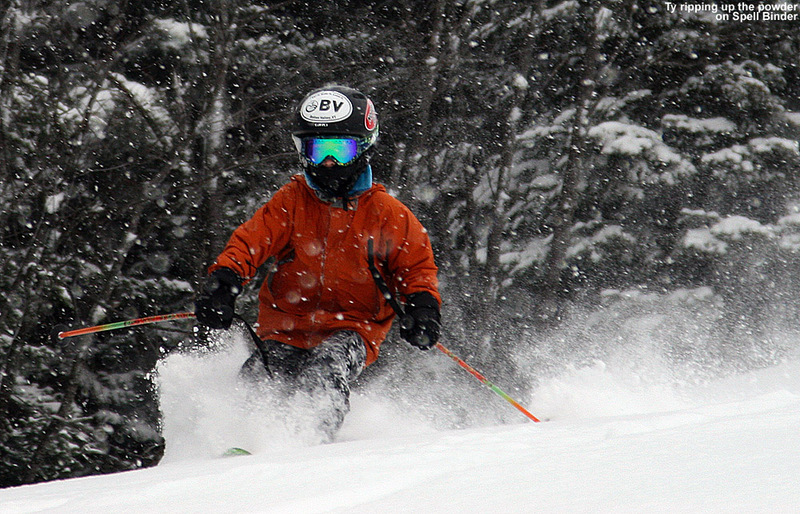 Ty glides through some Champlain Powder today in a glade below Heavenly Highway. 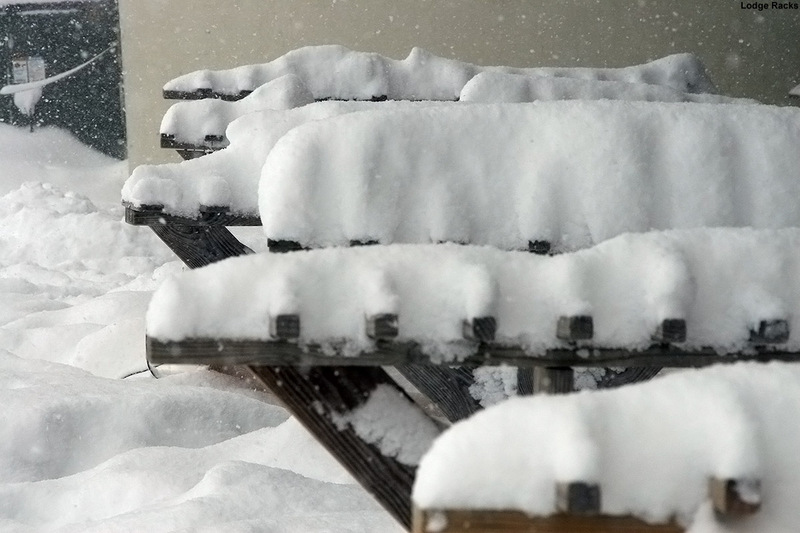 There was some warmth in the area in the early part of the week that put a crust on snow surfaces, but then the mountains picked up in excess of a half foot of snow in the Thursday/Friday storm, and that remedied the issue pretty quickly. 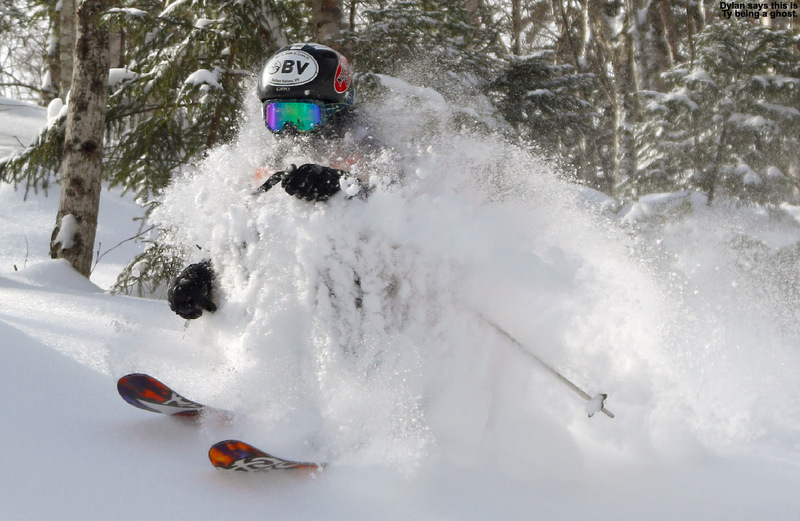 And, although the current storm has been focused down along the south coast of New England, the local Northern Vermont resorts reported another 2 to 3 inches of fluff to top the powder off further. 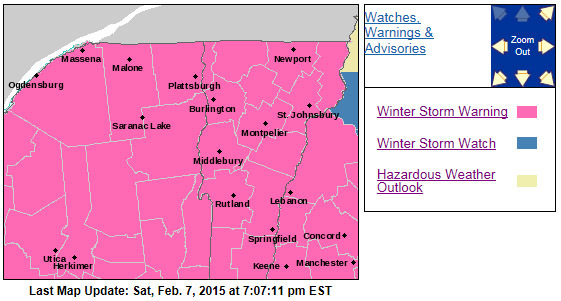 This latest addition was extremely dry snow, classic Champlain Powder™. With only about 8 inches or so of new snow atop the old base, and the top of that being some of our ultra fluff, it wasn’t going to be extremely durable when stacked up against resort levels of skier traffic, so it seemed like a great day to head out for some backcountry turns. 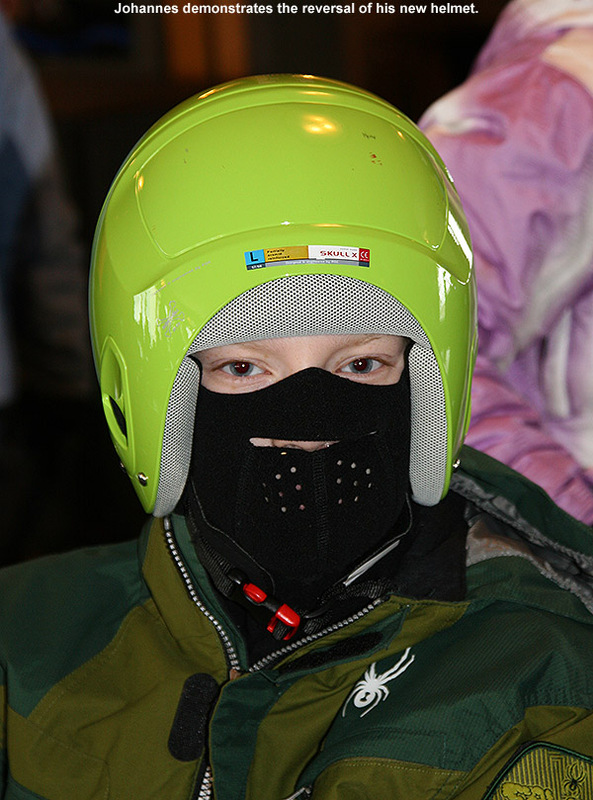 It also turned out that Dylan had to go to a birthday party today, so it meant that Ty and I could ski together; we’d be able to cover ground a little faster and extend our tour a bit compared to an outing in which Dylan was with us. Ty and I spent the morning around the house, and light snow was in the air because we were on the northern periphery of that storm off to the south. 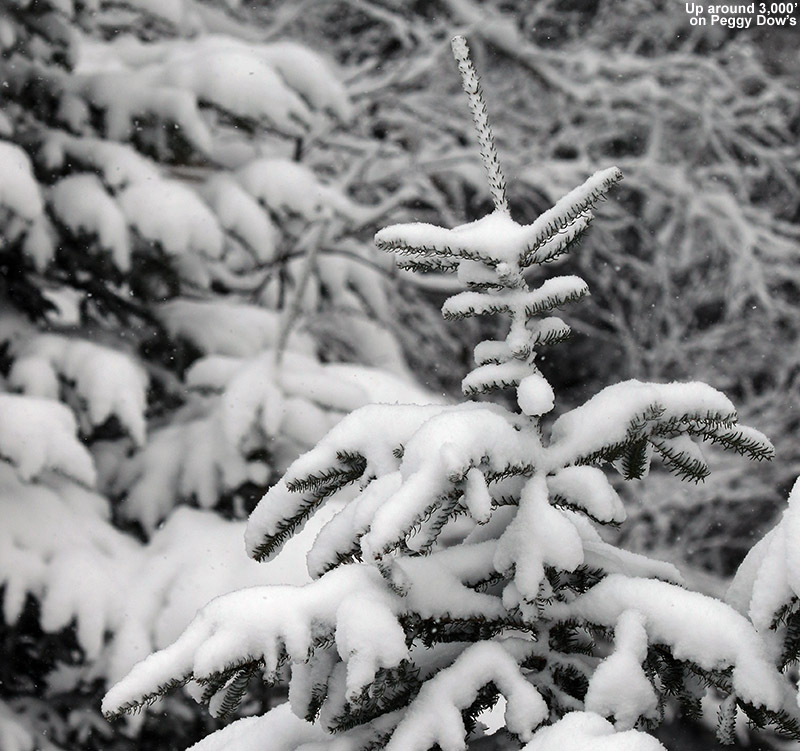 The snowfall transitioned from small 1-2 mm diameter flakes in the early hours, to huge, 1-inch monsters by mid morning. The small flakes deposited just a couple tenths of an inch, but by noon we’d picked up another couple of inches thanks to the loft from those huge flakes. My noontime snow density analysis revealed that the water content of the snow was just 2%; indeed it was as light as feathers. 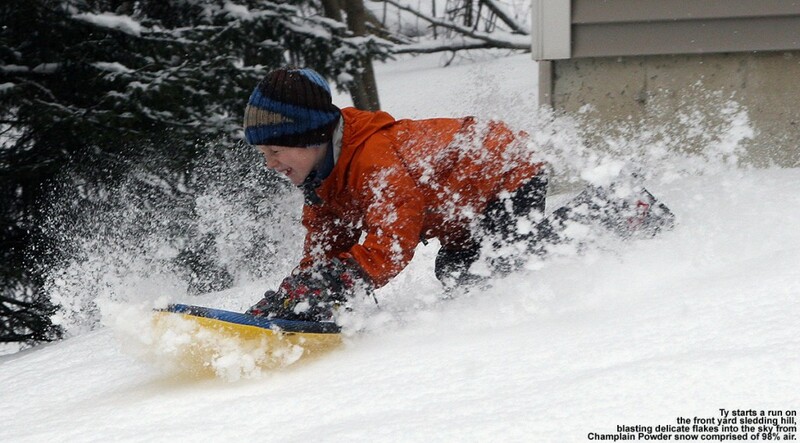 While I prepared the ski gear, Ty grabbed his sled and hit the front yard slope to enjoy some of the fresh fluff. 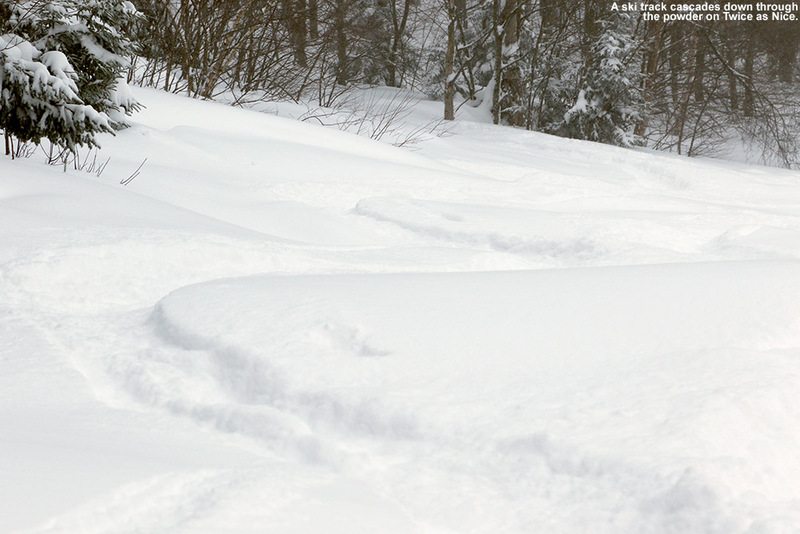 Even though the top coating on the snowpack wasn’t all that deep, it was so dry that it easily exploded up around him as he cruised through it on his sled. We talked about why this snow behaved that way, and I pointed out the fact that since this snow was 2% water, that meant it was also 98% air. 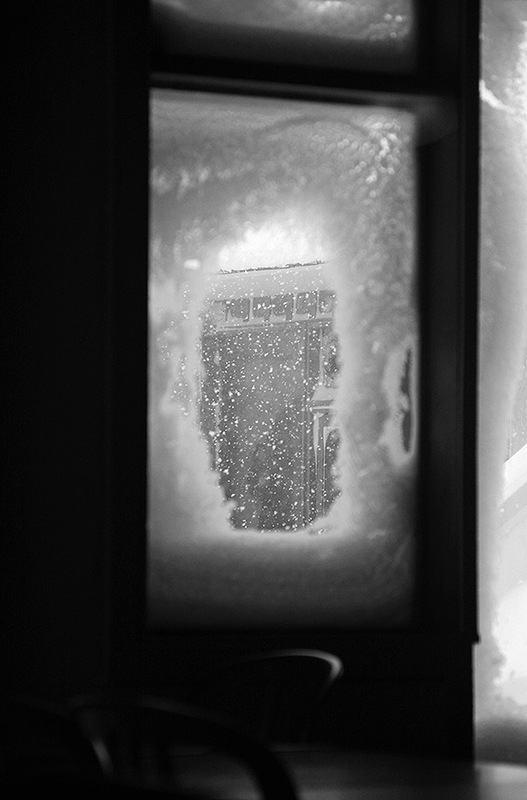 Looking at it that way really puts a perspective on just how delicate and airy such accumulations are. 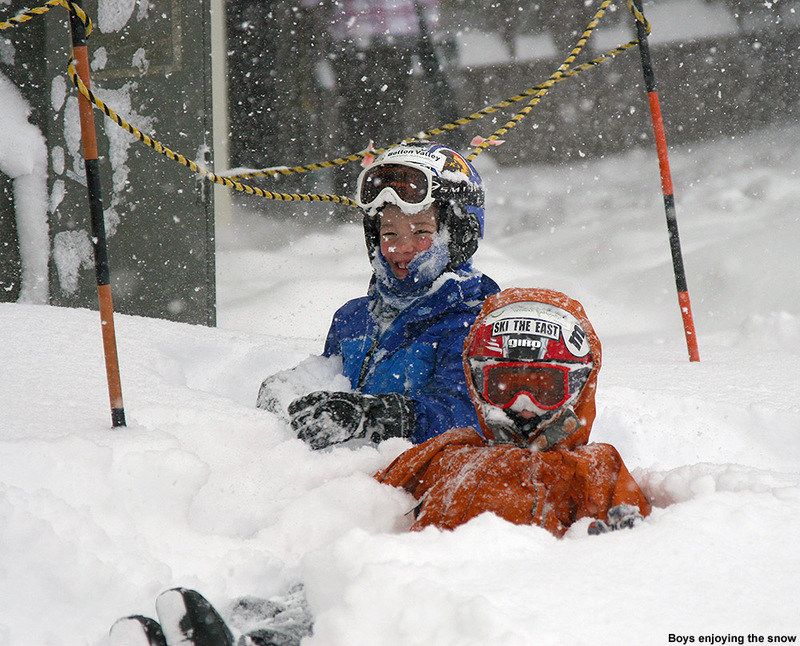 One great thing about living so close to Bolton Valley, is that when we get snow like that at the house, we know that they’ve received at least that much (and almost always significantly more) up on the resort’s slopes. Champlain Powder comprised of just 2% water explodes around Ty this morning as he takes a run on one of the sledding hills at the house. It continued to snow lightly at the house, and we’d picked up another half inch of fluff by the time we headed up to the mountain around 1:00 P.M. We skinned up Bryant, and I figured that with Ty’s energy level, we’d be able to head up past the Bryant Cabin and add in some of the higher elevation glades to our descent. The trip up Bryant was very serene, as we were surrounded by accumulations of that 2% water-content Champlain Powder™ that I affectionately call “see-through” snow. 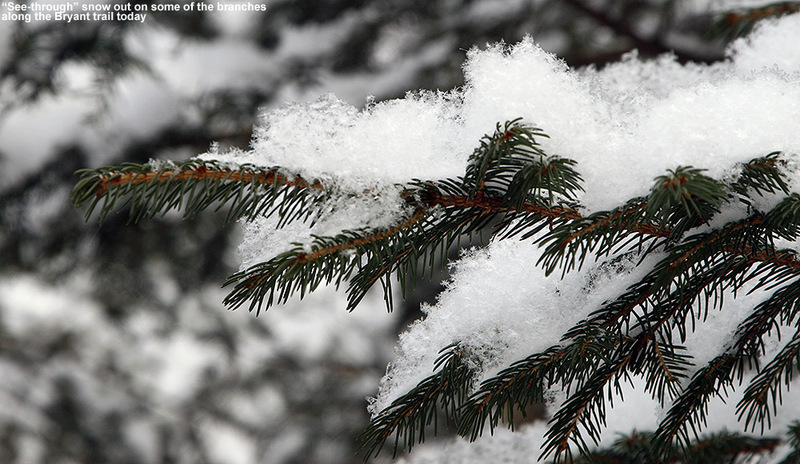 Indeed, the snow piles up with such loft on tree branches and other objects that you can actually see right through it in certain spots. 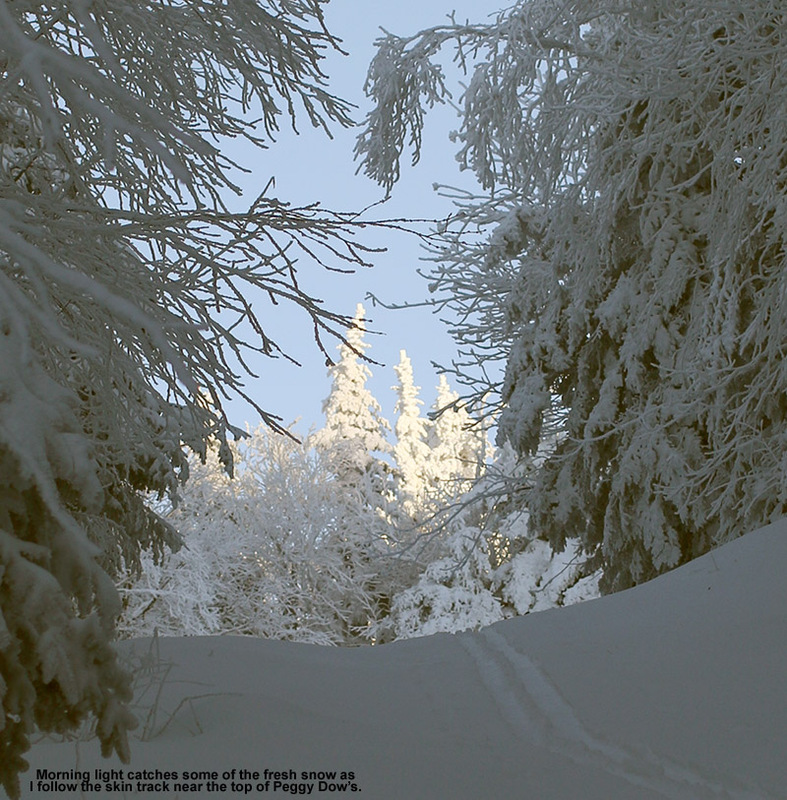 As we ascended along the trail, touching the snow-loaded branches would produce the most amazing effect, as hundreds of huge crystals would scatter and float ever so slowly toward the ground in a brilliant, shimmering storm. Once we approached the Bryant Cabin, we found out that it was occupied by a group that had rented it out for an overnight to enjoy some backcountry skiing, and they invited us to join them inside. 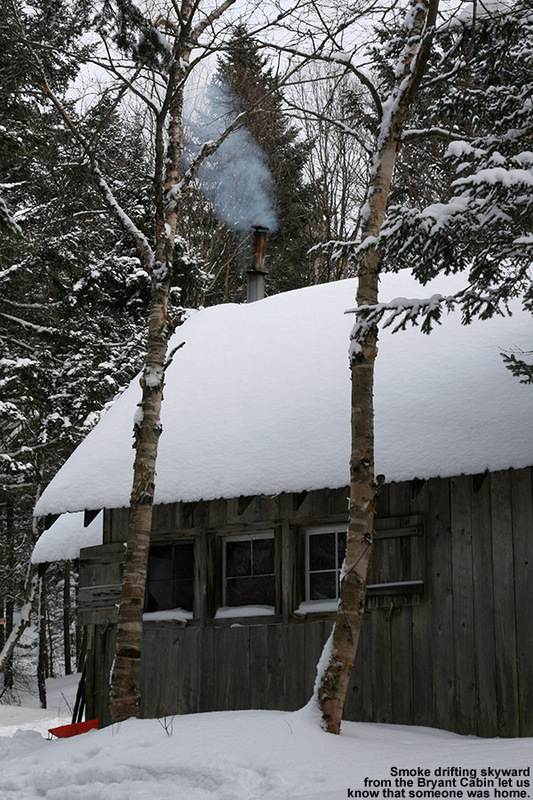 They had the woodstove running, and it was delightfully warm in there. Ty and I pulled out our snacks and hot chocolate, and had a great time chatting as Ty intermittently explored the cabin. I can’t recall exactly where the group was from, but I think at least some of them were from parts of Southern New England, so it was great to see that they had been able to come up and enjoy the snow – as deficient as our snowfall has been so far this season in Northern Vermont, farther south, the dearth of snowfall seems even worse. 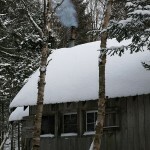 While we were there, various members of the group were in and out getting in some touring, and it was just what you’d expect to see at the Bryant Cabin in the heart of winter. 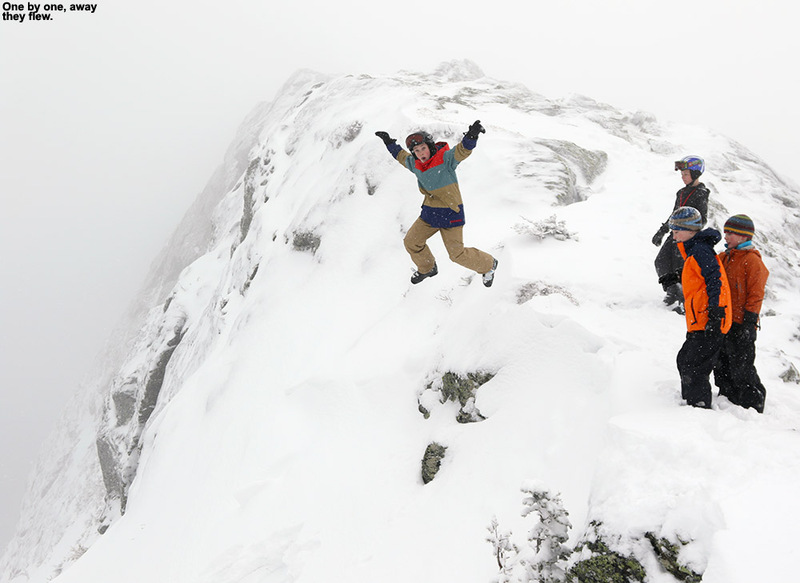 After our brief stay, Ty and I bid everyone at the cabin adieu, thanked them for the “warm” hospitality, and headed out to gain a bit more vertical before our descent. We used Birch Loop to connect to Heavenly Highway, and then continued up for a few more minutes to get to the higher glade that drops us down to Gardiner’s Lane. While switching gear, I initially couldn’t figure out why my pack smelled so much like hot chocolate, but then I saw that my thermos had leaked a little liquid into the pack’s interior. The thermos has one of those recessed valves in it that enables you to pour out the liquid without removing the inner cap, but it’s easy to forget to close that valve (and you often can’t tell at a quick glance whether it’s open or closed). Indeed, simply screwing the outer cup/cap back on the top of the bottle was not liquid-tight. The spill wasn’t too large, but I did smell like hot chocolate for the rest of the tour and learned a good lesson about those valves – since it’s difficult to tell whether they are open or closed, close them as soon as you are done pouring so you don’t need to worry about it. 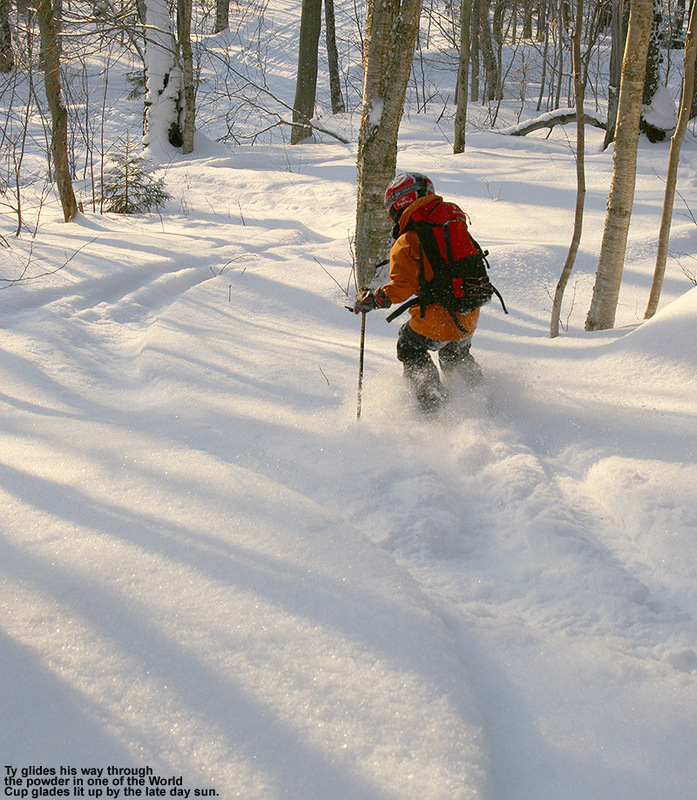 Finishing off the day in the backcountry glades with the golden light of the afternoon sun. That first glade dropping from Heavenly Highway has some pretty steep pitches, and even with all the new snow that had fallen, we would still encounter the underlying crust at times. Ty had an advantage, as he floated on top of the snow better than I did, and he even worked a few Telemark-style turns into the pitch. We both managed some nice turns though, since there are plenty of open spots in that area. We next headed down to JJ’s, and since the trail itself had seen a good deal of traffic, we opted to check out some trees off to the side. 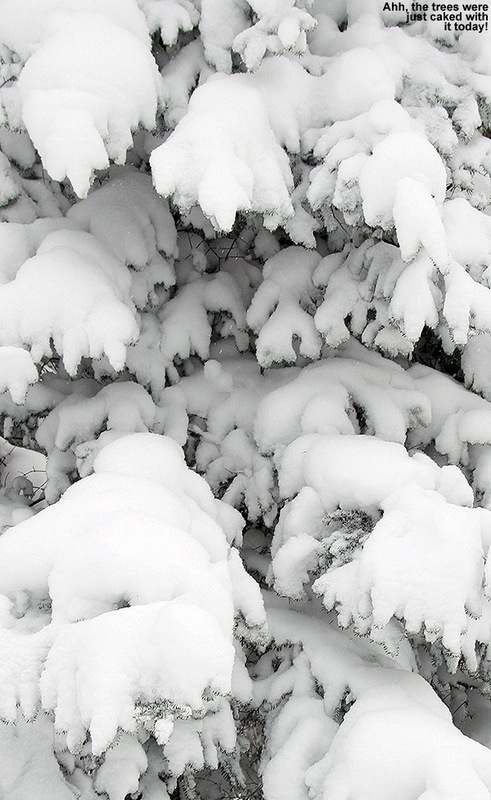 The tree spacing was just too dense for the pitch of the slope combined with the consistency of the snow, so we didn’t get a lot of great turns in there. We got back into some really awesome turns though once we hit the lower elevation glades down near World Cup. The pitches there are more moderate, and there were just a couple of old, partially buried tracks from other skiers, so that set us up for some beautiful floating through the trees in the golden light of the setting sun. It was definitely a stupendous way to end the day.